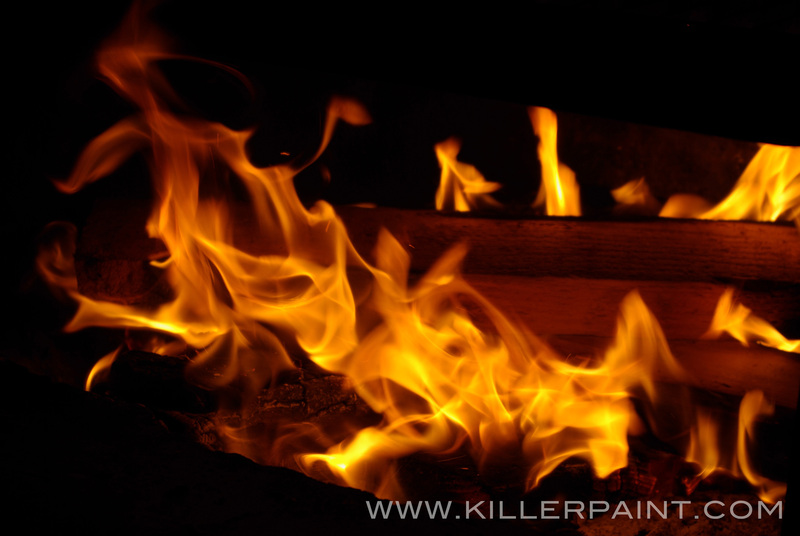 The information here is intended to help painters and artists get the best results they can when painting realistic fire in unusual situations on their own projects. For detailed instructions on painting realistic fire, we recommend that you watch The Secrets of Airbrushing True Fire™ – Part 1 DVD. For True Fire™ Basics Part 2, “What You Throw Down,” on our website, click here. True Fire Basics Part 3, “Your Sword vs. Your Shield” can be found here. 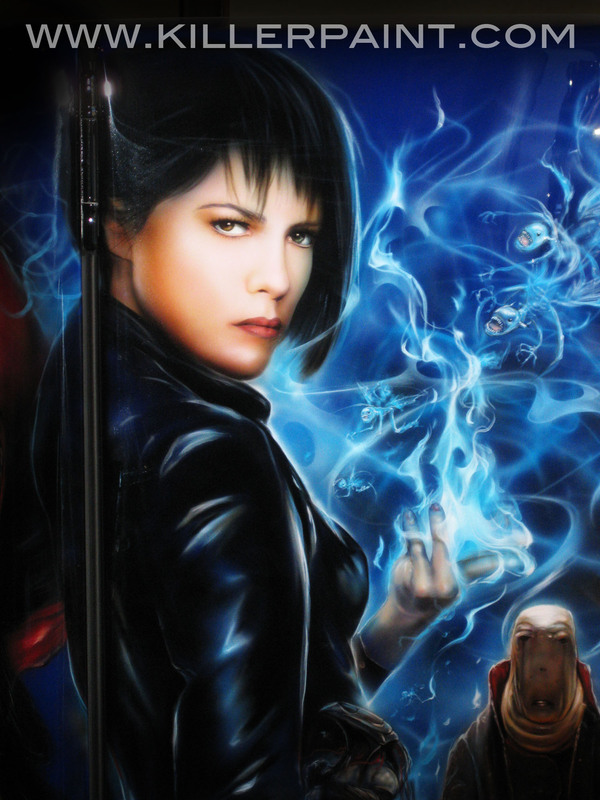 We’ve previously discussed (in Part 2) the best situations in which to paint realistic fire- the background colors that tend to work best, the placement of flames that will give you the most bang for your buck, etc. However, sometimes you are presented with a situation that is not ideal for painting True Fire™ at all. 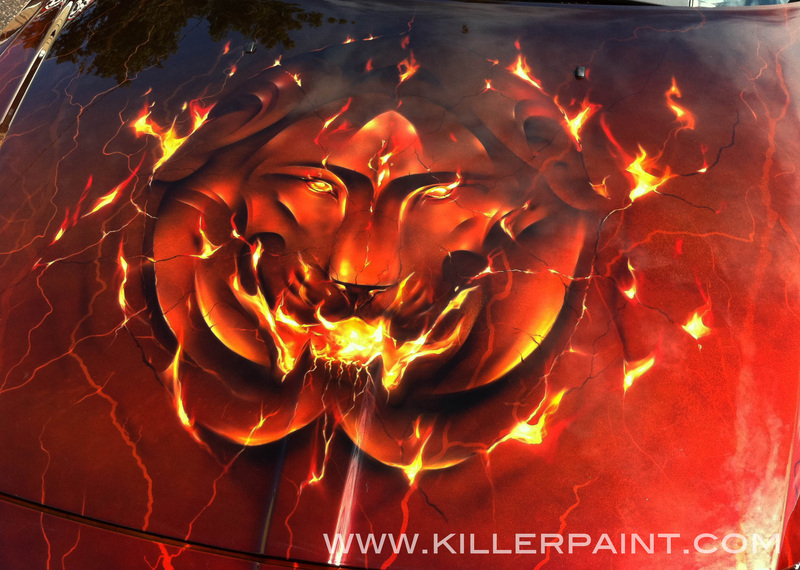 -What do you do when you need to paint fire on a white car? -What if the object you are painting doesn’t lend itself well to having flames on its surface, or has some areas that you have to avoid that throw a wrench into the flow of a good fire application? 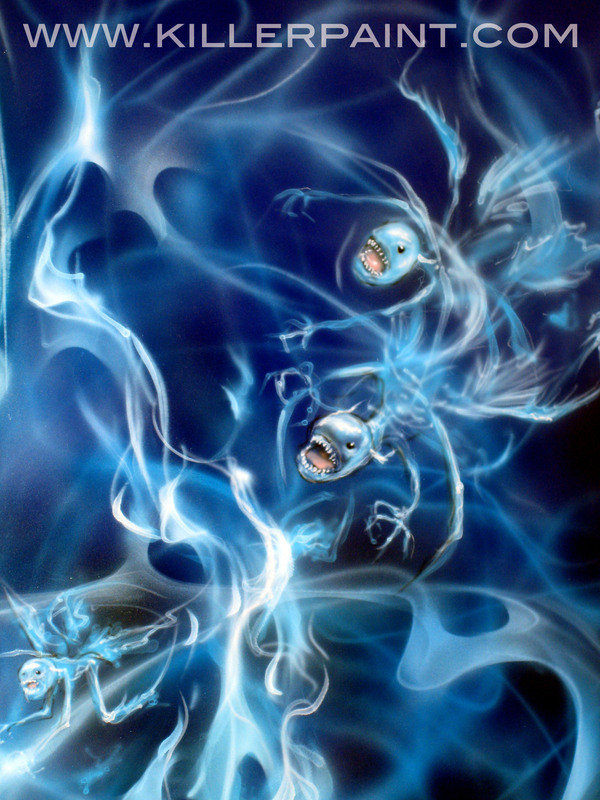 In this case, painting on silver requires doing extremely pale flames. There is a reason that realistic flames work best on darker colors, and especially on black. 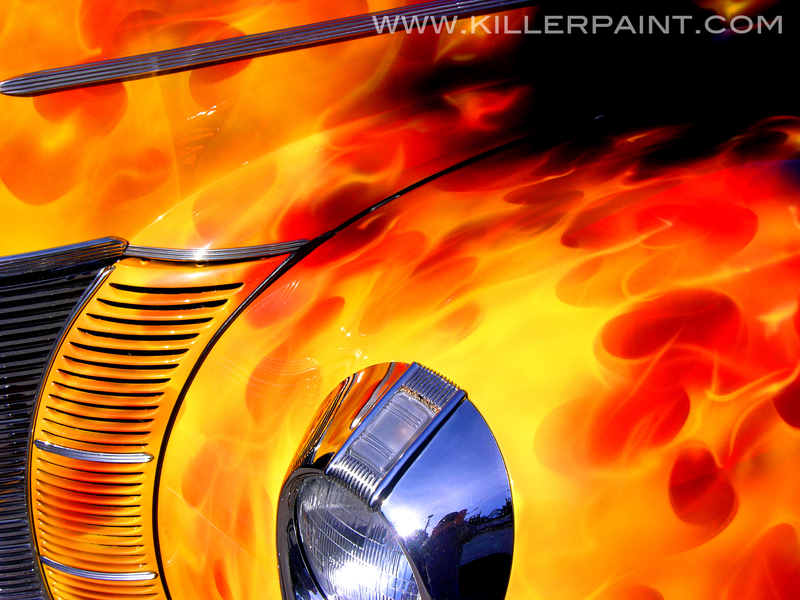 When painting True Fire™, the goal is to make it look as much like real flames as possible. First and foremost, fire glows. It is bright. Since paint does not, the way to make your flames appear luminescent is go for contrast- to paint brighter colors on a dark surface- use the difference to build the illusion. When painting fire on a light-colored surface though, the background robs the flames of much of their brightness, and they will be less vibrant. And while it’s by no means an ideal scenario, flames can sometimes be painted successfully on some lighter colors (with a lot of finesse). Unfortunately, the result typically doesn’t have as much punch as it would if the background were darker as compared to the flames on it. If you find yourself in a situation where you can’t avoid painting on an unfavorable surface, there are ways to turn the tables at least a little in your favor. Then your flames have a better chance to look their best. 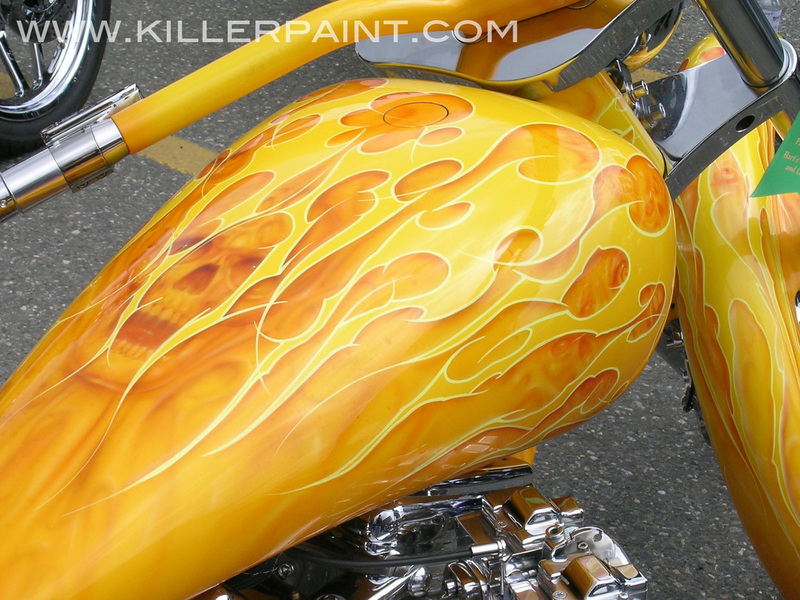 Backshading your flames will help them stand out when they would otherwise be washed out by the base color. If the base color is as light (or lighter) than your flames, then one way around it is to basically cheat just a little, by laying down a darker color just behind your fire. One that your flames will look good on. If you are painting flames of a similar color tone to your surface, then you can put down areas of deeper color roughly where your fire will lay out. Or, if it is acceptable for the job at hand, you can do a color fade over a broader area. One variant method is to lay down cloudy areas of black, regardless of the base color. When done correctly, it can be made to look like dark clouds of smoke. This not only maintains plausibility, but provides maximum contrast for the flames. Changing the base color on just part of a project can give you a step up. The most direct way to deal with a pesky base color is to change it to a more suitable color. 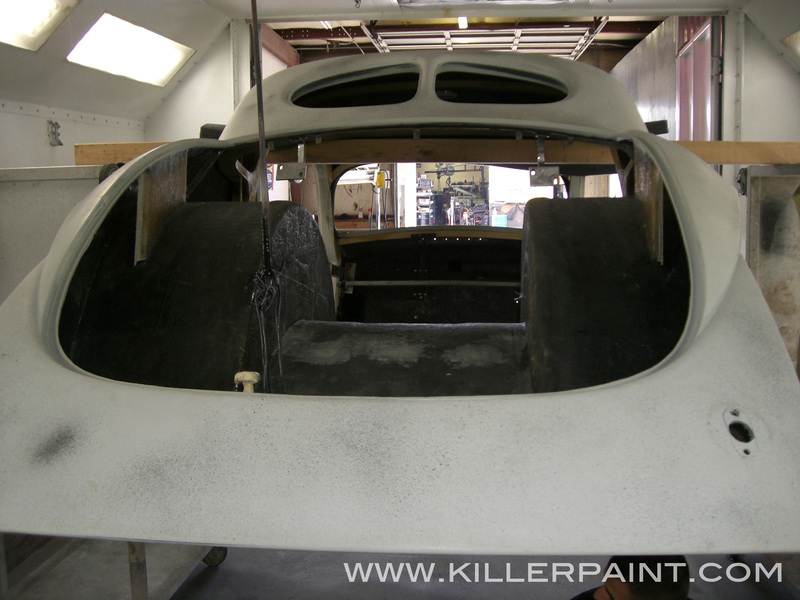 Unfortunately, repainting a whole car is a lot of time and work. If it is a job for a customer, then they may not be up for something that expensive. However, changing the color in limited sections can sometimes be a feasible compromise. 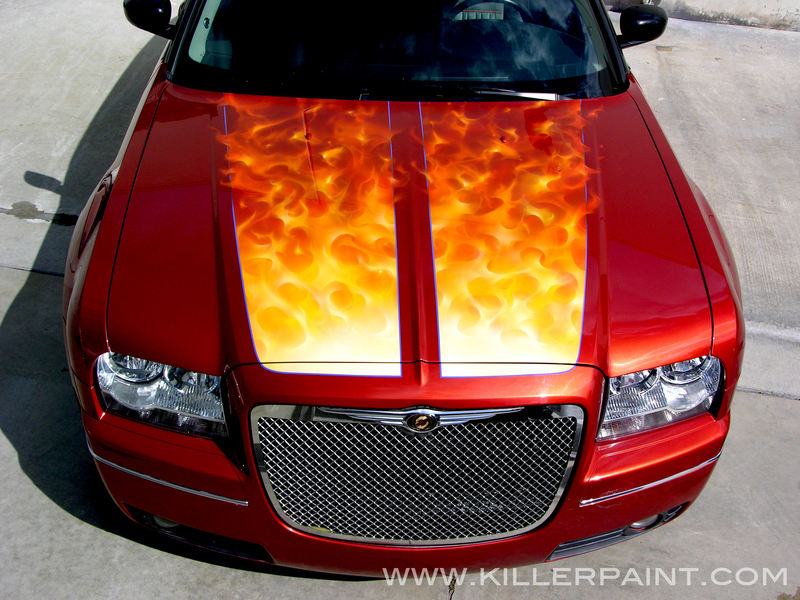 Painting a two-tone section on a car is a good way to not only give your flames a better chance to stand out, but to add more interest to the paint job on the car overall. Creating a section of more accommodating color gives you a well-defined area in which you know your flames can look good, and without having to change your painting technique to compensate for a weak background color. If doing a large two-tone color change is going to be too drastic for your project, then using the same approach in more manageable sizes is another path to consider. Laying down stripes of an appropriate color to paint your fire on is a relatively painless alternative to larger base color changes. 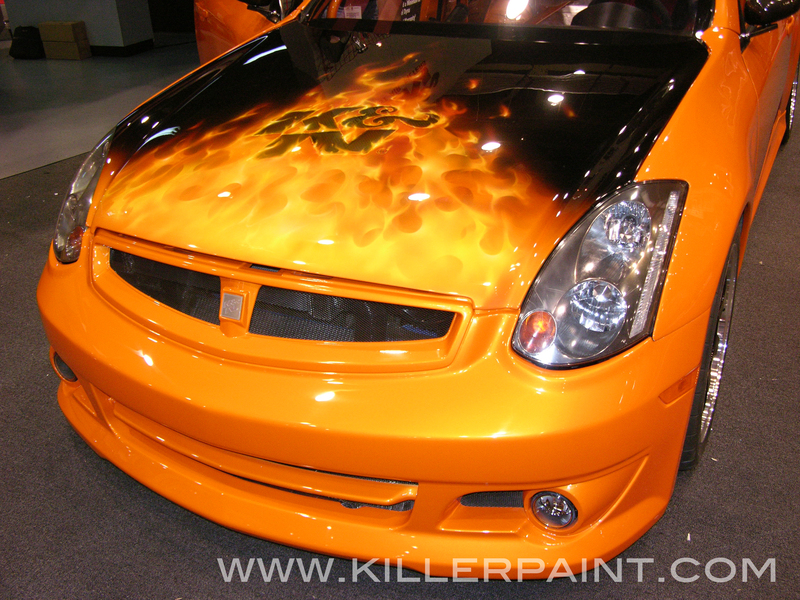 You can use simple, well-liked designs, like rally stripes on cars for instance, as a canvas for your flames. Then, even somewhat conservative customers are more likely to embrace the result. If you are feeling relatively ambitious, then a more creative way to give yourself some favorable painting areas on a project is to section off areas with more creative designs than just simple stripes or bands of color. Different designs, shapes, or even emblems can be used to create a “window” where your fire can live. 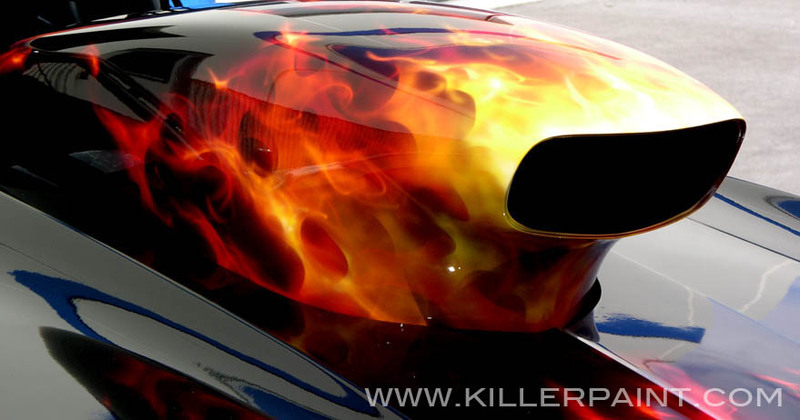 One popular method at Killer Paint is to reveal sections of black by making them appear to be exposed by the “tearing away” the original base color, and making the edges look like shreds of material. This approach gives a painter a lot of options, as one can vary the amount of surface area that is painted the new color. You can use just a few modest shreds as accents, or go all the way, and have large swathes of area exposed and painted your new color. Strategic placement of your paint spaces can also help you avoid awkward or unpaintable areas on a project as well. Also, the quantity of fire in the “torn away” areas can be adjusted to suit the projects needs very easily as well… and you needn’t limit yourself to painting only fire in those spaces. There are numerous possibilities to take advantage of, using this approach. We hope you found this information useful. 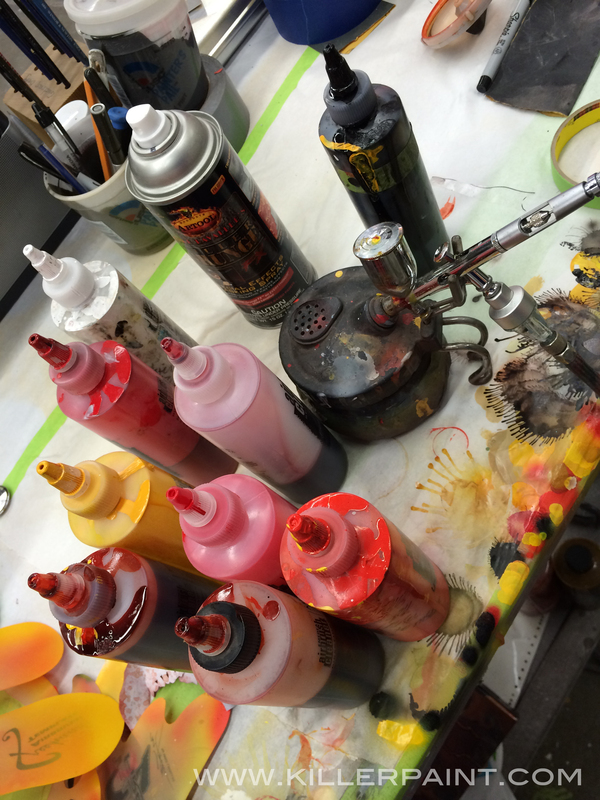 We may have posts about airbrush art and painting True Fire™ in the future, so stay tuned! Thanks for visiting! 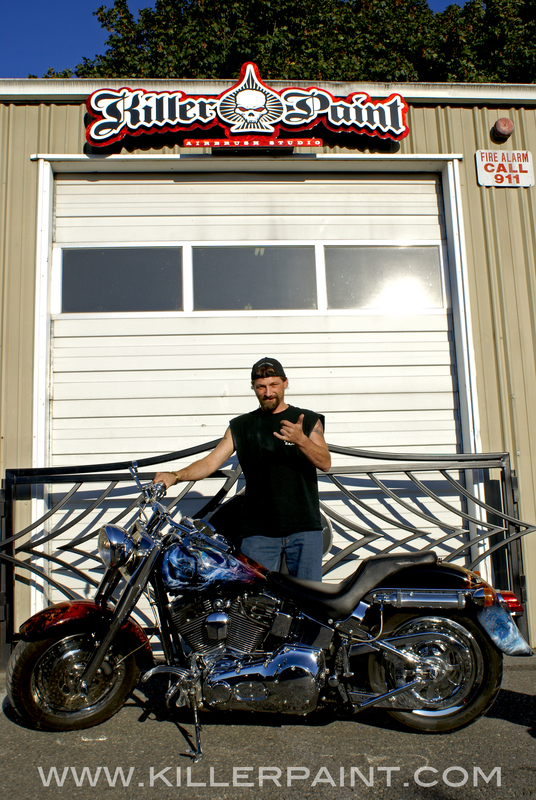 Several years ago, Johnathan Hillstrand, Captain of the crabbing vessel F/V Time Bandit brought his bike to us looking for a truly supreme paint job. The Time Bandit is one of the featured vessels on Discovery’s popular television documentary-drama the Deadliest Catch. After discussing some ideas, Mike had an idea of what he was going to do on this project. The theme would elaborate on the Time Bandit concept, and show sailing scenes and battles at sea throughout different eras in time, including pirates, vikings, sea monsters, and more. 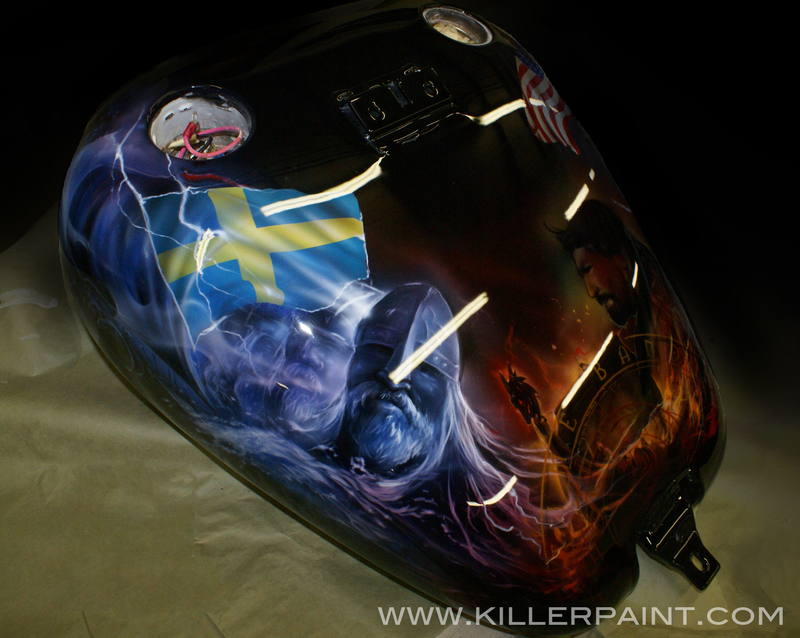 The viking side of the fuel tank, still in progress. 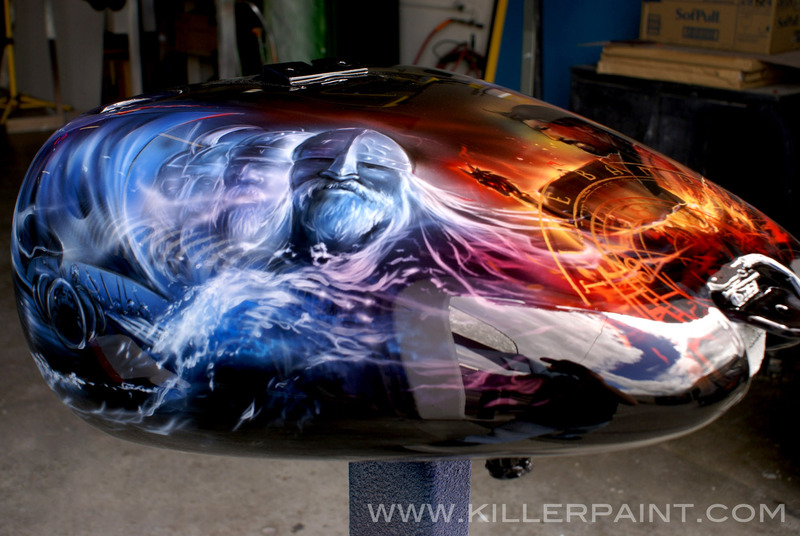 The left side of the tank portrays the ethereal visages of viking warriors and their ship at sea. This side is done in mostly cooler blue tones, with some purple and pink accents that help blend the scene from this side to the images on the tank’s top. A Swedish flag was added above the scene as an homage to the Hillstrand ancestry. 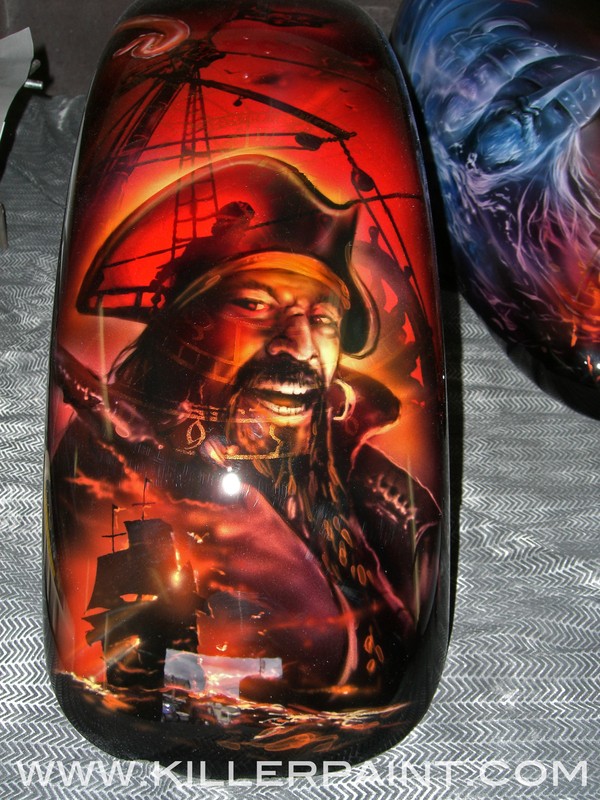 The top side of the tank shows another viking vessel in the background, with a profile portrait of Captain Jonathan in the modern day. A time-spanning Time Bandit clock-like graphic is overlaid on the scene in a bright metallic gold, which catches the light brilliantly in the sun. This scene is done in warm glowing tones, in contrast to the harsher cold sea scenes on the sides. 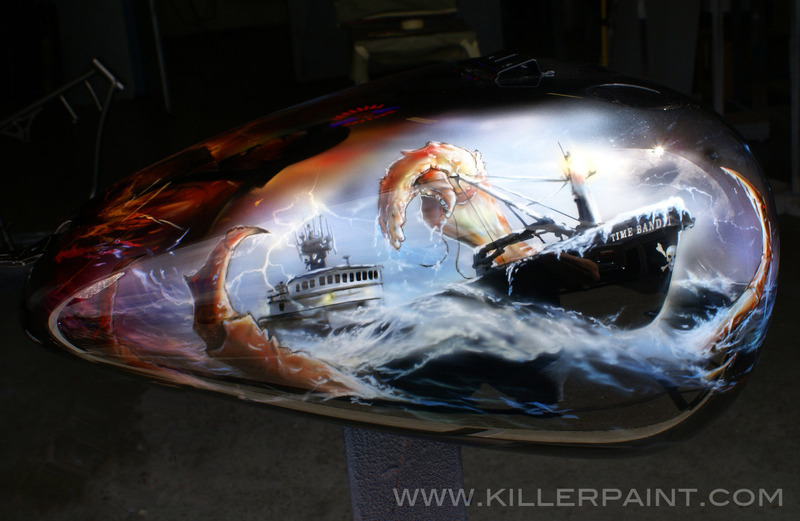 The modern-era scenery carries over onto the other side of the bike’s tank, where the current day F/V Time Bandit is shown battling a gargantuan monster-crab at sea. An American flag flies above the scene, a counterpart to the Swedish version on the opposing side. 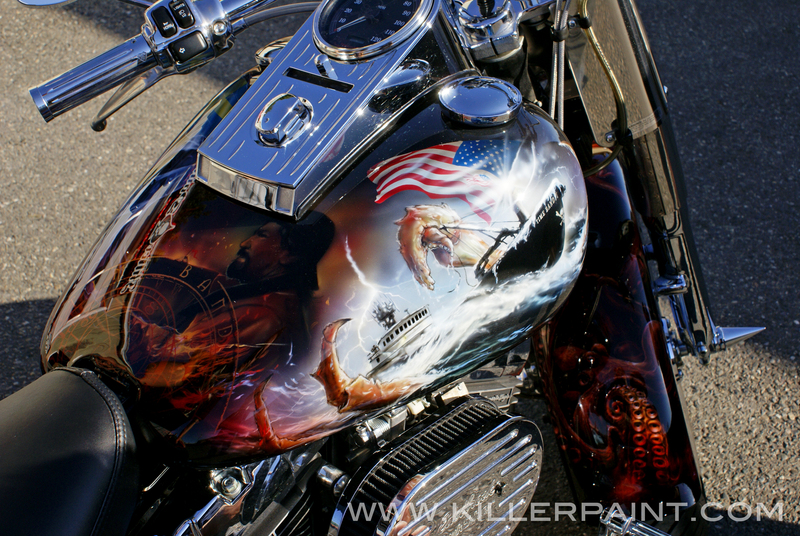 On the front fender is a montage of images from a sea pirate era, including a buccaneer captain that looks somewhat familiar. A sailing ship floats below the portrait, backlit by a late-day sun, casting a fiery reddish hue on the whole scene. 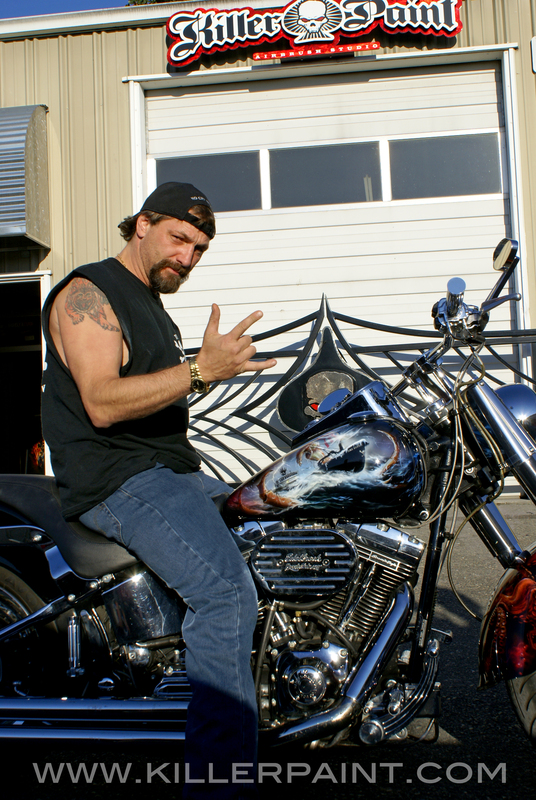 Above the tail light on the rear fender of Johnathan’s bike is a Time Bandit “Jolly Roger” flag, engulfed in flames. On the right-hand side of the fender is a manifestation of the Greek Sea God Poseidon, angrily brandishing his trident while a storm rages. On the opposite side is a crab pot being hauled onboard in spite of the ocean deity’s wrath. A map of the Bering Sea is superimposed over the whole set of scenes, painted again in a bright gold metallic paint that shines in the outdoor light. 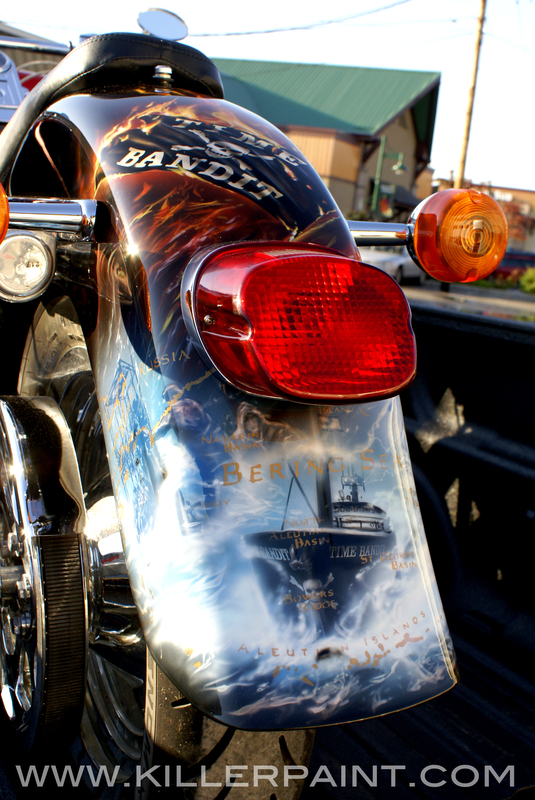 On the lower center of the fender, just below the tail light, the F/V Time Bandit plows through stormy seas, with the skull and crossbones emblazoned on the bow. The deckhands at work bringing in another catch can be seen more completely, just above. 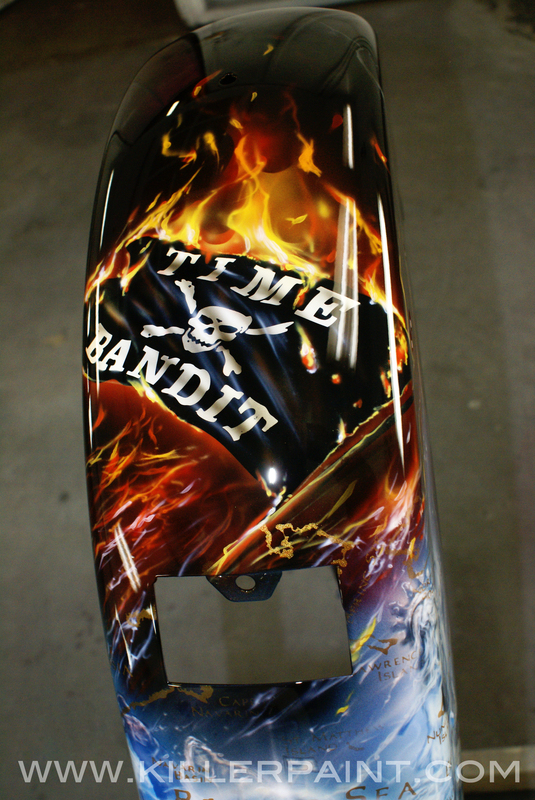 Right before Johnathan was to arrive to pick up his newly painted bike, Mike had the idea to etch the Time Bandit logo around the perimeter of the glass on the center gauge. It was finished literally moments before he arrived, so unfortunately there are no pictures of it to post. Captain Hillstrand definitely approves of his bike, though! 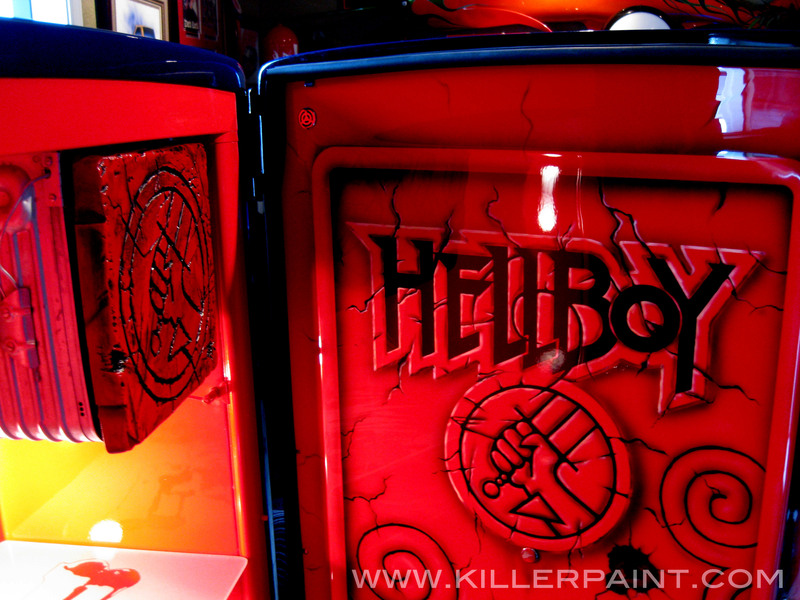 At the Killer Paint shop, you’ll find plenty of artwork and decorations all over, from the front room to the bathroom. One set of pieces that are on display around the shop are some of the illustration renderings of cars done by some big names. 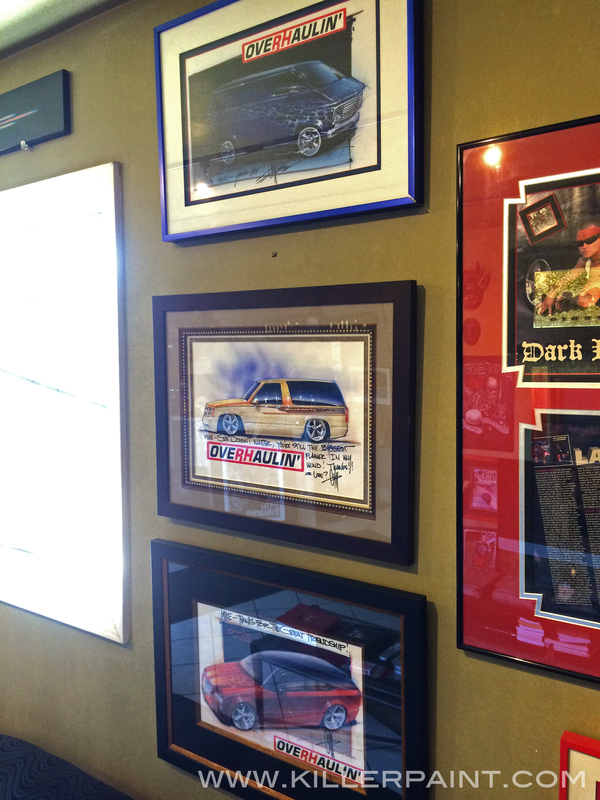 In the front entry room of the shop, three such pieces signed by Chip Foose hang on the wall by the window. 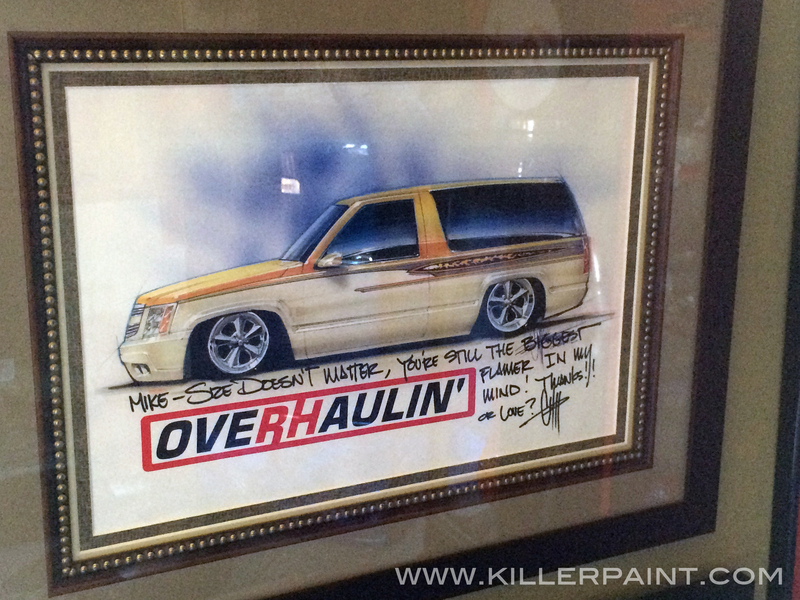 These three are all projects from episodes of Overhaulin’ that Mike appeared in. 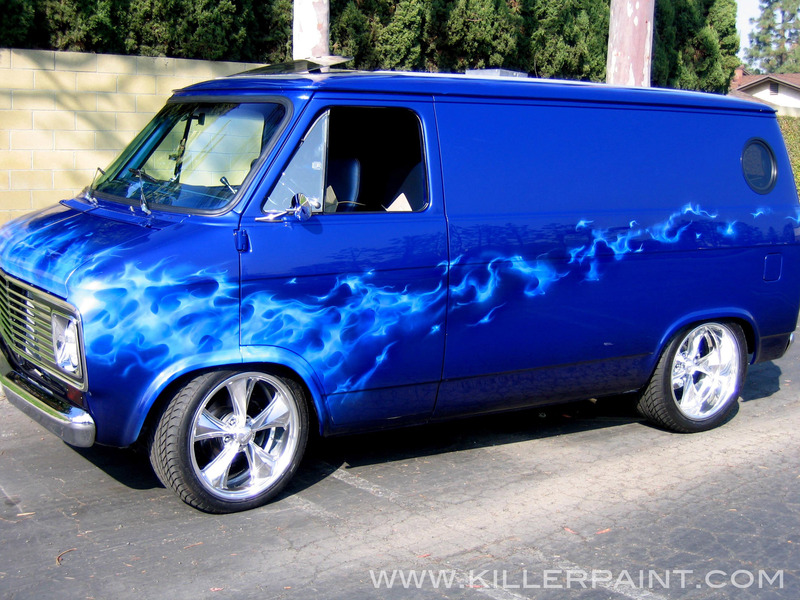 This piece is from Season 3 episode 17 of Overhaulin’, “That 70’s Van” where Mike gave this Chevy van the True Blue fire treatment, including a fire-breathing dragon on the back. 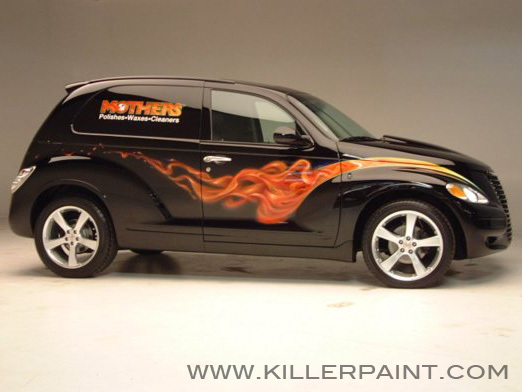 This Chevy Tahoe got its makeover in season 4, episode 4 of Overhaulin’, “Bling!” Mike’s flames appear in the black stripe down the sides of this truck. 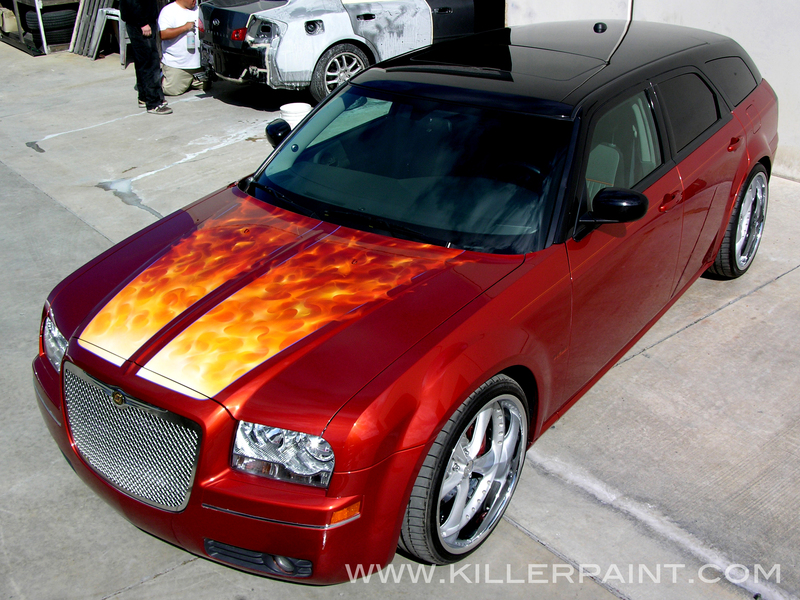 This Dodge Magnum appeared in episode 12 of season 3 of Overhaulin’, “Fiery Brit”. 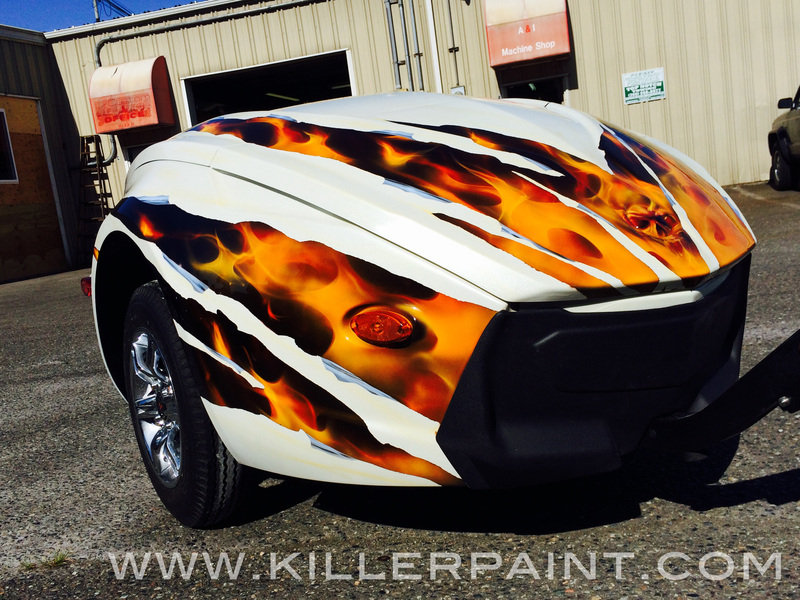 Rally stripes engulfed in True Fire™ run up the hood and re-appear on the back end of this project car. 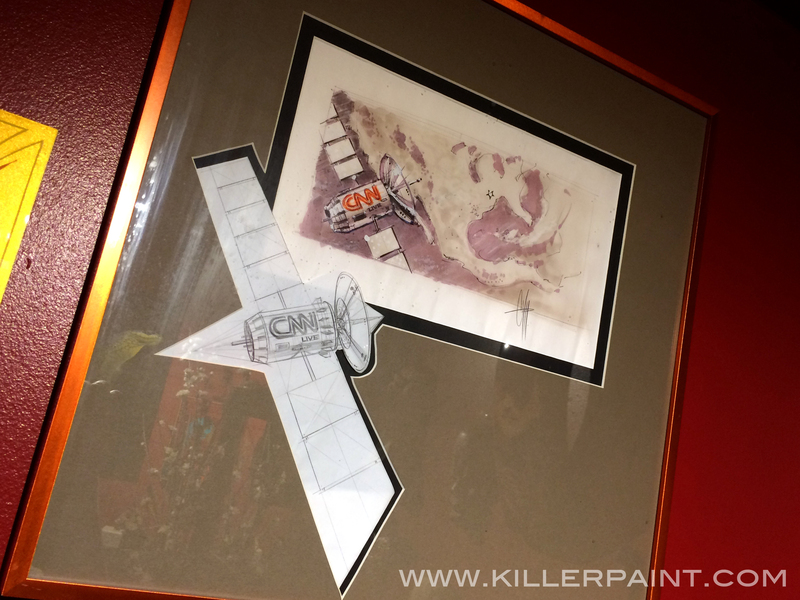 The bathroom, of all the places in the shop, is probably the most interesting in terms of decor, artwork and assorted memorabilia at Killer Paint. 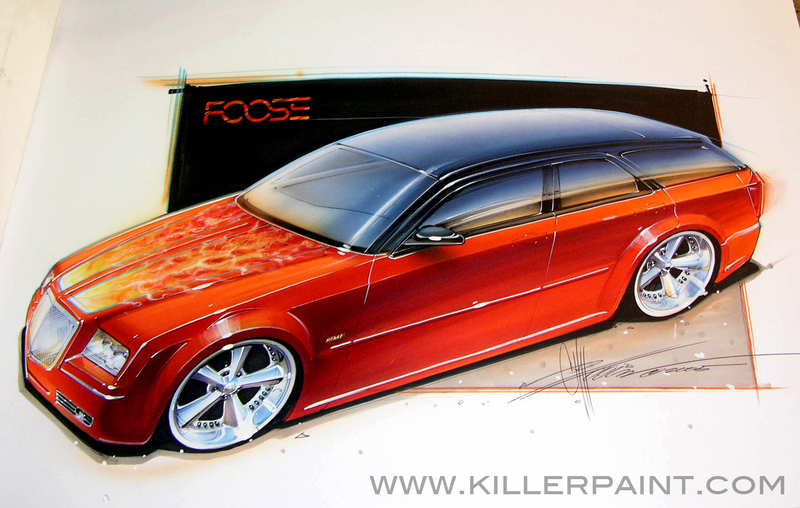 We’ll cover it in its entirety at a later date, but on the bathroom wall, there is another rarely seen Foose mockup, from the special CNN Hummer project on Overhaulin’ from season 5. This particular design was designated for the roof of the vehicle. The finished version can be seen in the photo above. 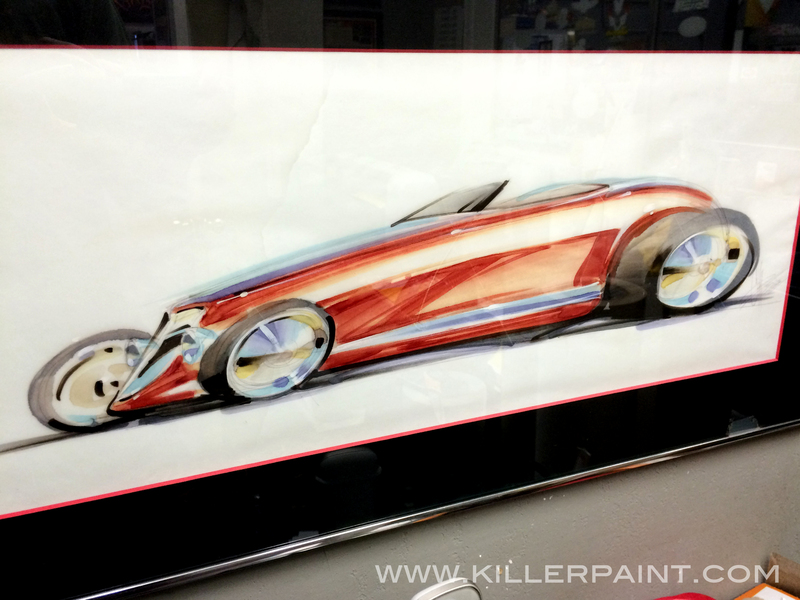 Another Chip Foose original hangs on the wall in the office just below Mike’s legendary Hellion painting, the lion with the fiery mane that helped launch True Fire™ into the mainstream. 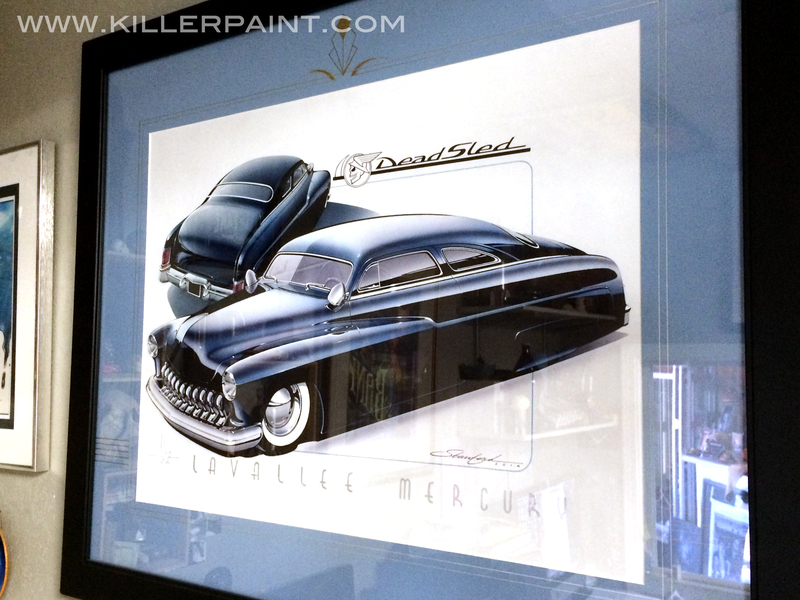 Meanwhile, vehicle art legend Steve Stanford agreed to do a rendering of Mike’s Dead Sled as it will appear when completed, according to Mike’s plans. 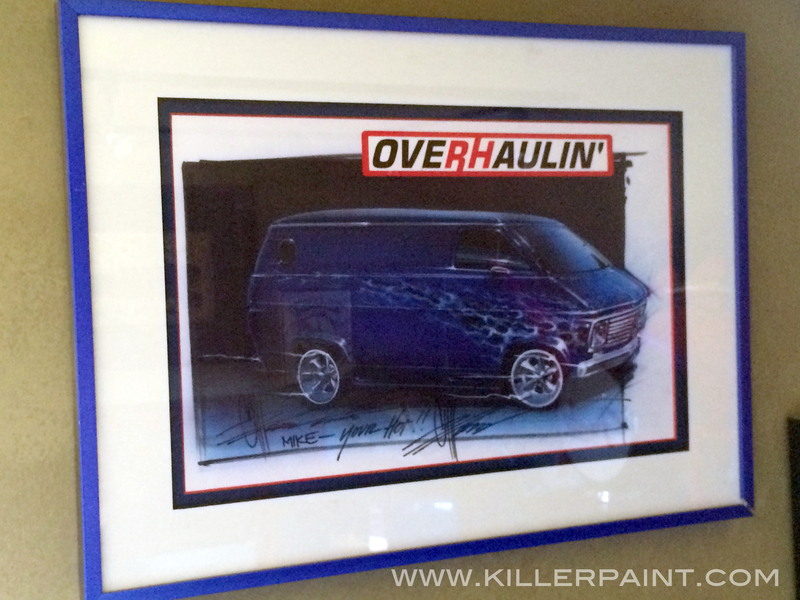 This original masterwork now hangs proudly on the wall in the office- a rare gem in its own right, and one of the most prized possessions at Killer Paint. 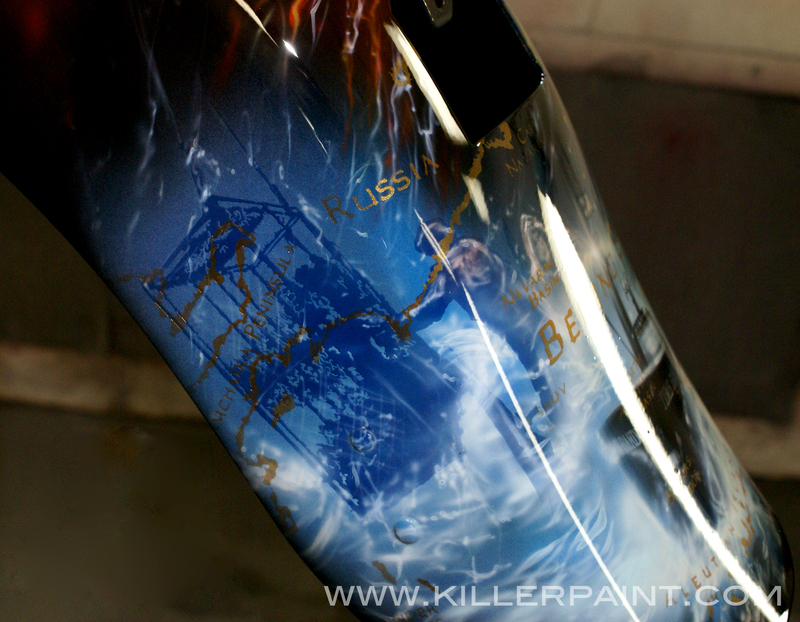 We hope you enjoyed taking this peek at the Killer Paint shop. Let us know if there is anything you would like to see us post here in the future! Perhaps these projects gave you some ideas, or you already have an idea in mind for your own car, truck, motorcycle, refrigerator, etc? 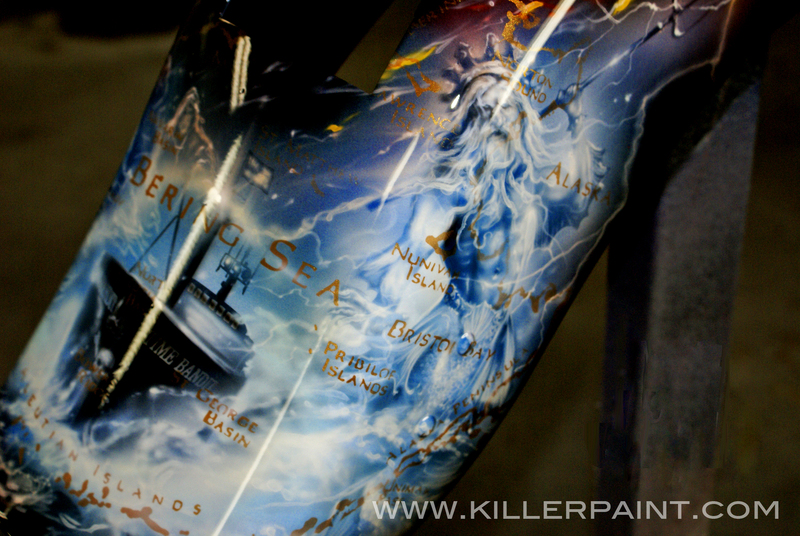 This time we’re taking a look back at a bike that came to the Killer Paint shop a few years ago. 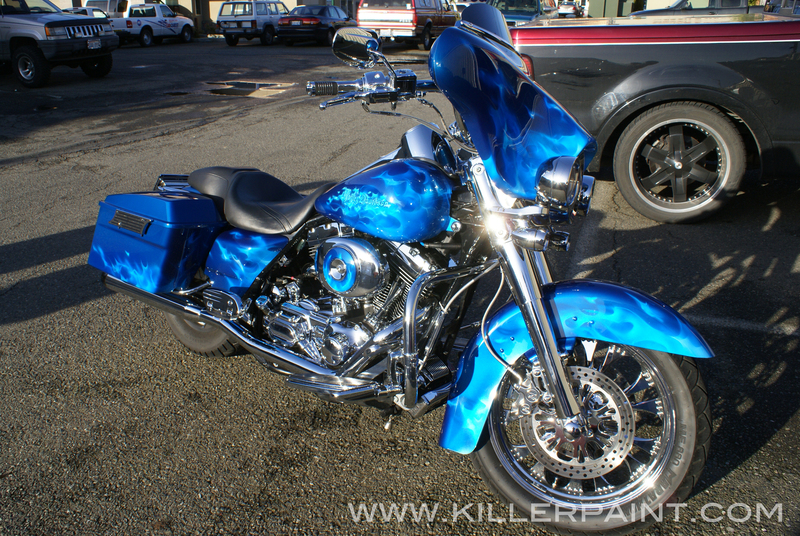 This Harley-Davidson bagger got a pretty straightforward paint job, but still looks pretty phenomenal. 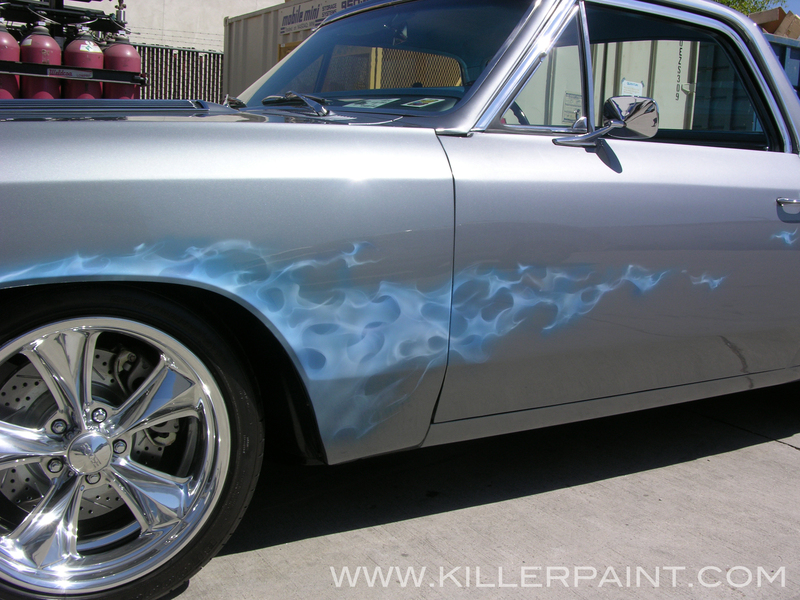 The base color on this project is a pretty spectacular blue, even before the flames were added. 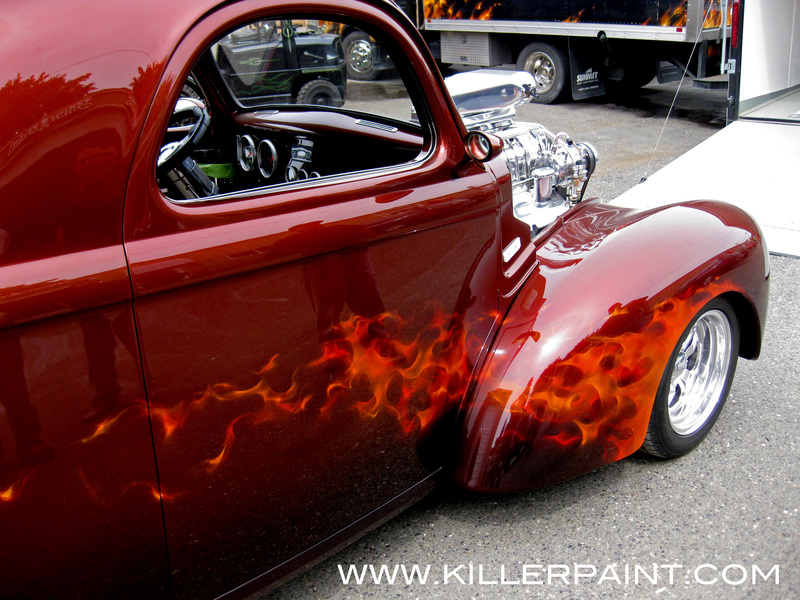 Having a rich metallic or pearlescent base color to start with helps enhance the look of airbrushed flames, adding that extra “glow” to the overall paint job. As far as True Fire™ goes, this one got the all-over treatment. 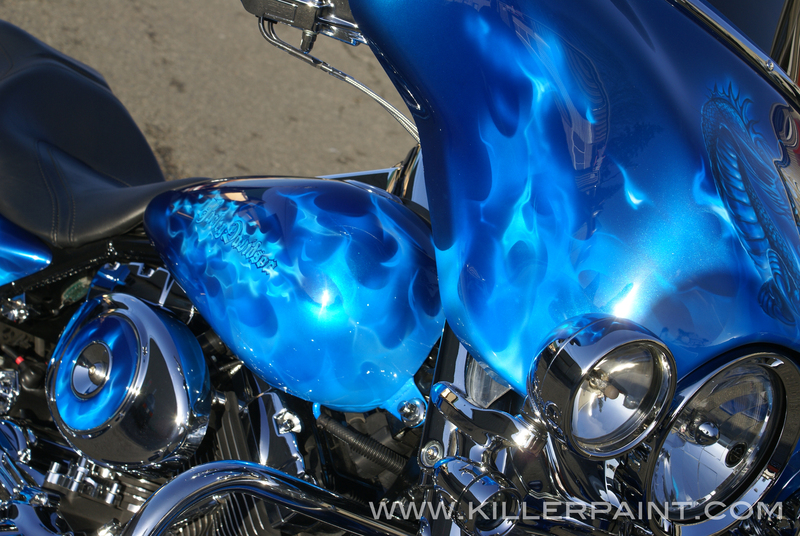 True Blue fire was added to every piece that had any paint on it, from front to back fender, even including the air cleaner cover. This is a good example of painting realistic flames that are a color that is in the same range as the background color. This approach works especially well in blues. It creates a more subtle, complimentary look that can still turn heads, but isn’t as in your face. 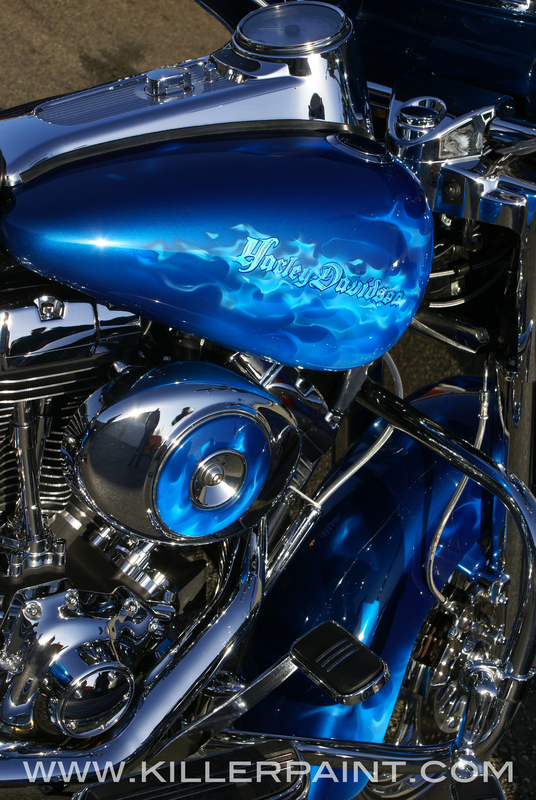 Some customers prefer painted emblems in lieu of having the original emblems put back on after the bike is painted. The Harley-Davidson emblems on the side of the tank were removed, and replaced with a more calligraphic, incised-looking letter style. The text was lined in a darker blue to help it stand out from the flames behind it. 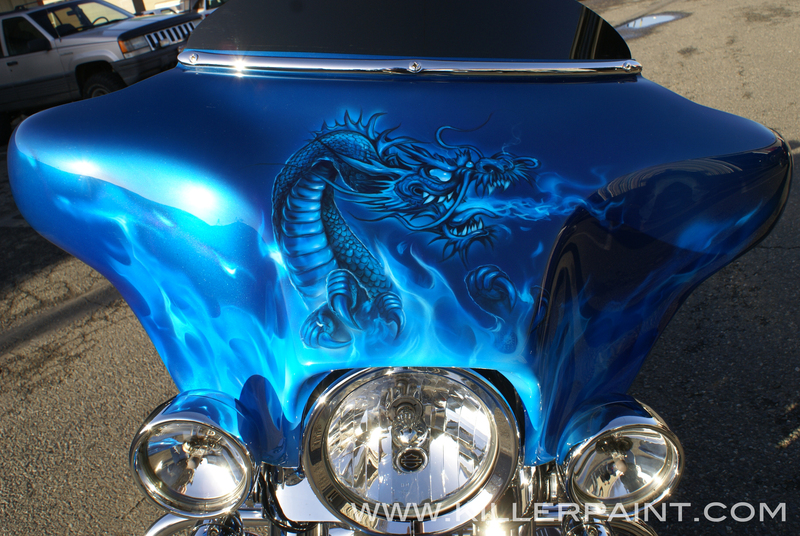 The fairing on this Harley got a stylized Chinese-style dragon on front, breathing a bit of blue fire as well. This one is more stylized, with a more tattoo-art type look, and less like traditional Chinese art. 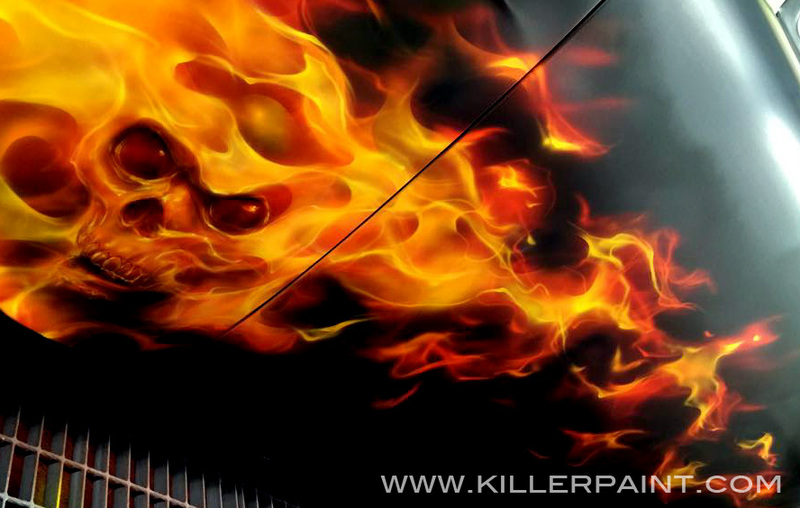 The information here is intended to help painters and artists get the best results they can when painting realistic fire on their own projects. For detailed instructions on painting realistic fire, we recommend that you watch The Secrets of Airbrushing True Fire™ – Part 1 DVD. 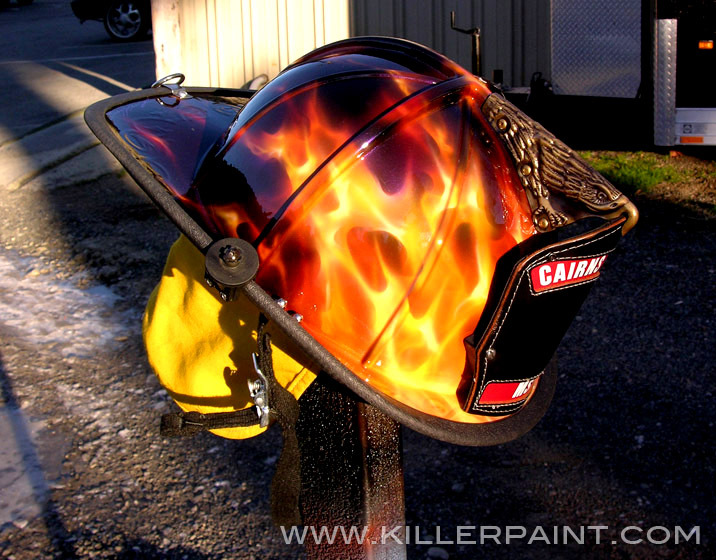 When painting realistic fire, it is important to be able to balance the amount of airbrushing you do freehand, versus the amount done with a template or shield. 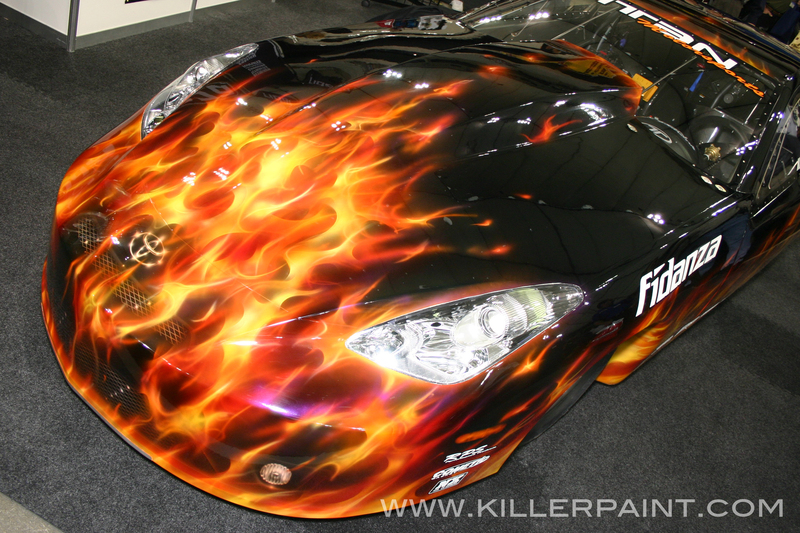 To achieve believable looking flames, it is necessary to mix it up. 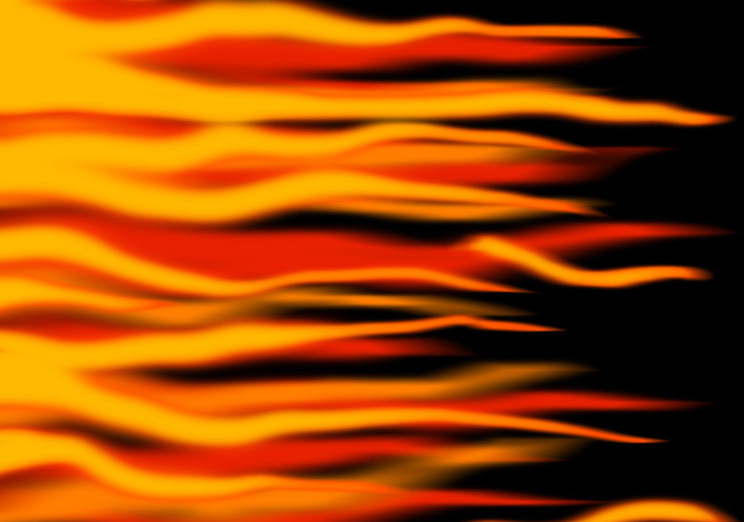 If one tries to paint flames entirely freehand and without any templates whatsoever, the results tend to look less crisp, and lacking in fullness and excitement. At worst, you can end up with what we sometimes call “angel hair” fire- which can look long and stringy, and have very little of the energy that gives fire its distinct character. Using a freehand shield helps add some definition and variation to your artwork. Some people avoid using templates or freehand shields due to the cost, but investing in the right tools for the job can really make a difference in the final artwork you create. You may be surprised at the improvement. Solid flames are okay… just when you are doing a “tribal” design. On the other hand, if one relies entirely on templates to build their fire, they are likely to have problems of a different sort. Too much template usage can have the opposite effect- it gives the flames too much structure, and creating good fire in artwork requires striking a balance. Overbuilt flames start to look abstracted or stylized, often looking more like layers of tribal blade designs than True Fire™. At the extreme, you can get what we often refer to as “Swiss cheese” fire- appearing like large blocks of fiery colors punctuated with many overly-defined holes in them. The key to solving both of these problems (and more) starts with something we’ve discussed before- Making sure you Know Your Fire. Arm yourself with good reference photos and a studied knowledge of flames that look like the kind you would like to paint (remember, fire has a broad range of appearances.) Then you will be better able to strike a balance in your painting technique. If necessary, practice on scrap panels, or smaller items like mailboxes, bicycle helmets, bowling pins or metal folding chairs, until you feel you have your technique down. Then you can move on to larger projects like motorcycles or cars. 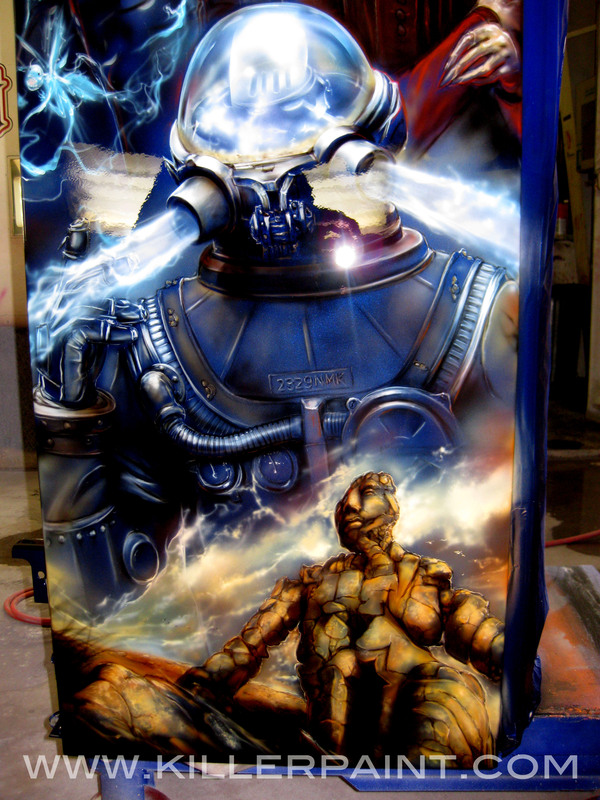 You really don’t want to be working out the kinks in your airbrushing process on something expensive! It’s just a recipe for disaster… Especially if you mess up on something that doesn’t belong to you. It should be noted that this all assumes that you are trying to paint truly realistic fire. Sometimes stylizing your flames might be desired, depending on the circumstances. Make sure that is your goal from the beginning though, not the result of poor technique. 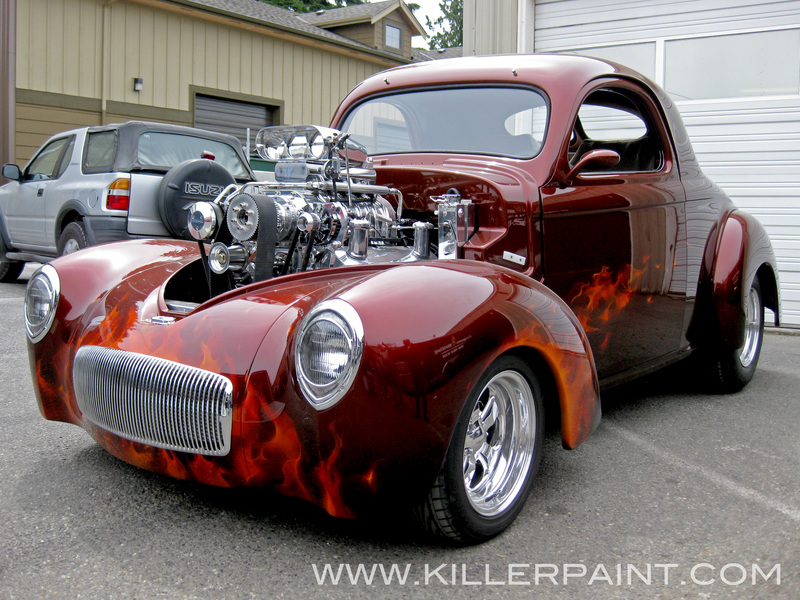 A few years ago, customer Bill P. came to us about a car he was building. 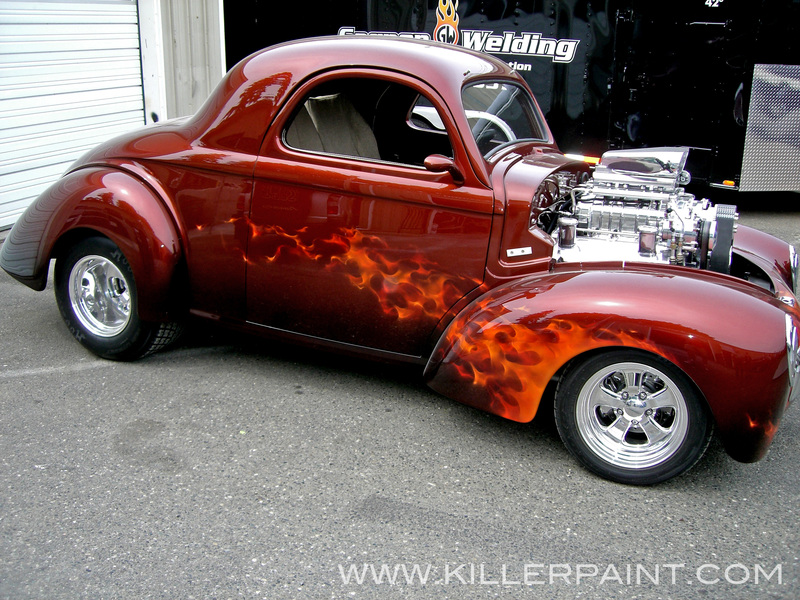 He had a fiberglass Willys coupe that he wanted to get painted, and he was looking for something away from the ordinary for this car. At the time it came to the shop, it was pretty much just a shell. 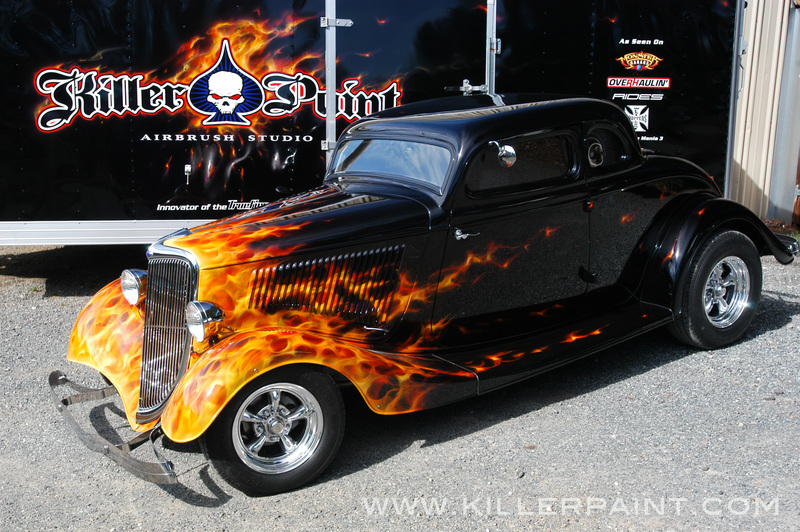 After discussing some options, Bill chose to go with some classic True Fire™ but wanted something unique for the base color to go with the flames. 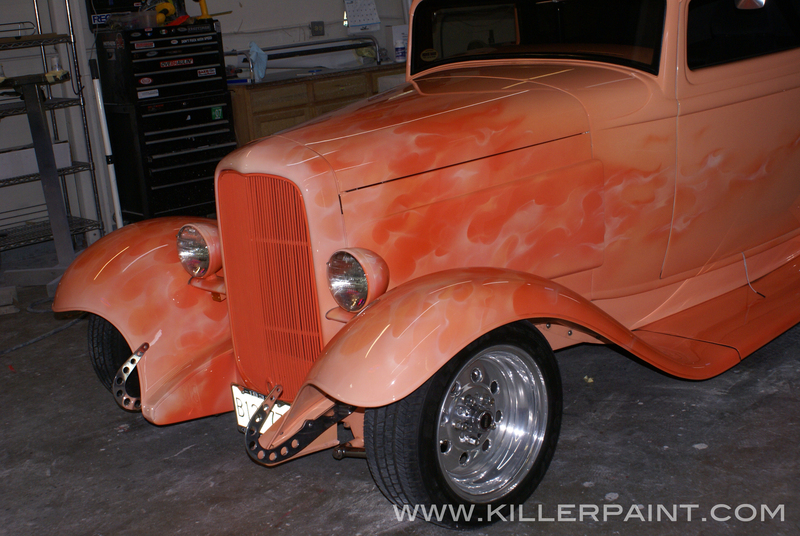 The base color for this car is a special recipe that Mike came up with for this project. 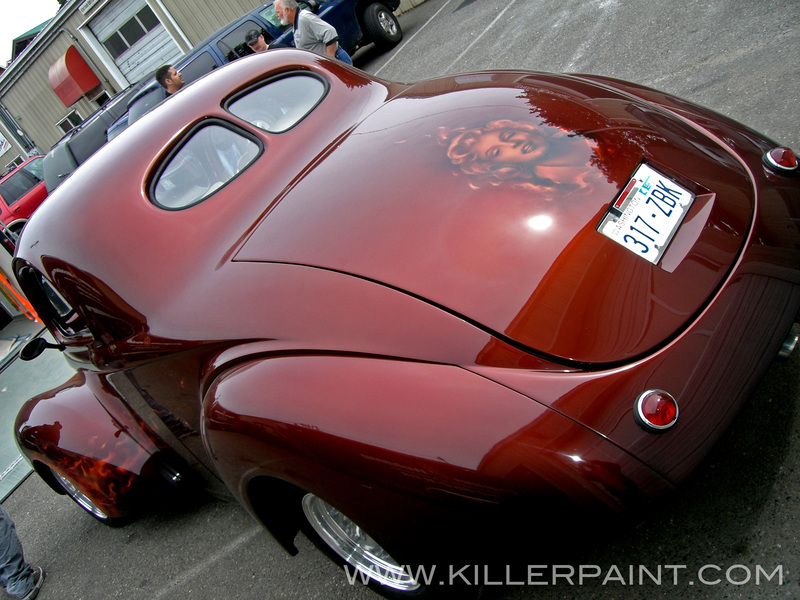 In a first for Killer Paint, our customer decided that he wanted a color that matched his wife’s hair. The final color is deep and rich, and has a warm glow to it, especially in the sunlight. 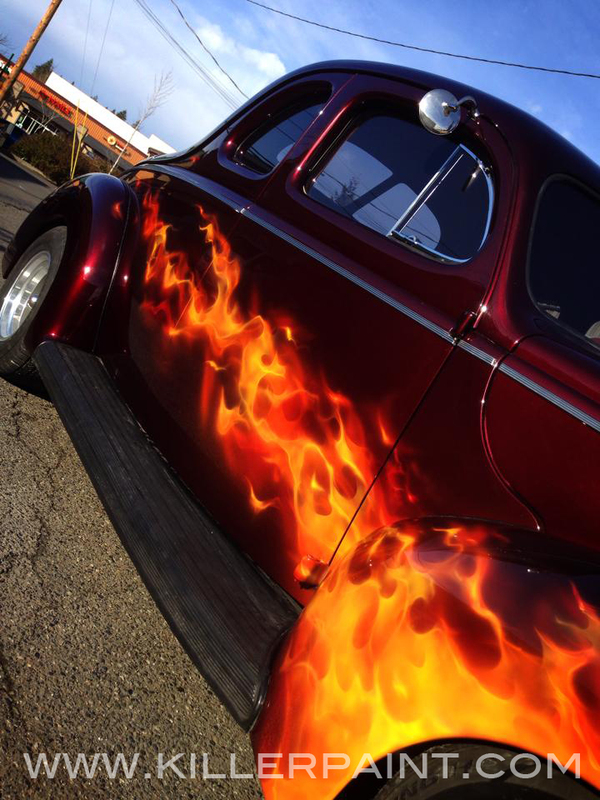 For the True Fire™ on this Willys, Mike went with the classic flame streak off of the wheel wells, which looks great on vintage hot rods. The fire itself is toned down a bit, keeping to the reds and oranges, leaving out the bright yellows in order to better compliment the reddish-brown tones of the body color. There is a little bit of heat coming up off of the lower front end as well. Bill’s wife is a fan of Marilyn Monroe, and collects Marilyn memorabilia. 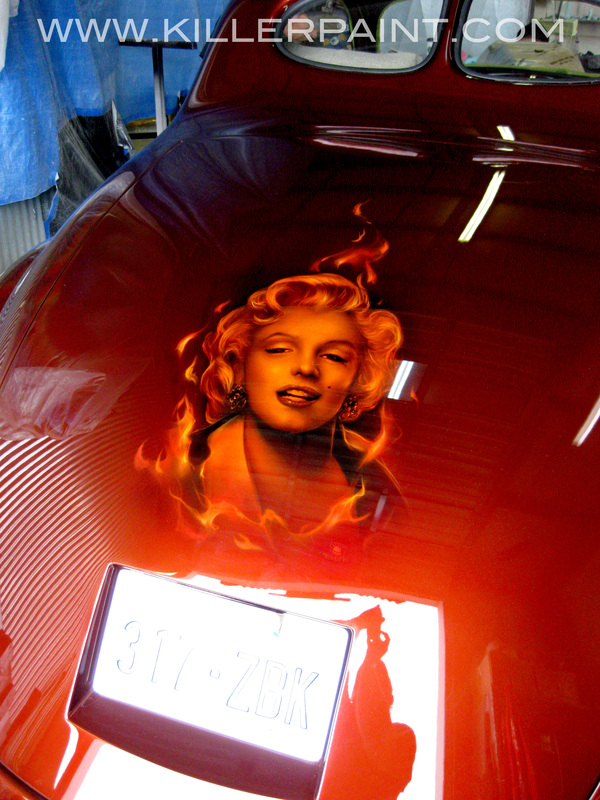 So for the trunk lid, Mike painted a portrait of the blonde bombshell in the same tones as the flames on the car. 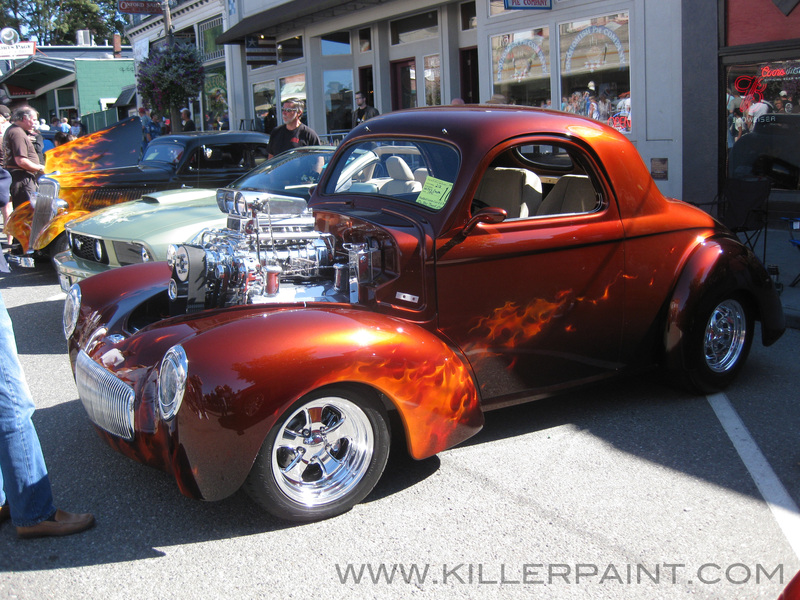 After it left Killer Paint, Bill continued on the build, and had it done in time to get his Willys into the lineup with some other cars painted at Killer Paint at the Annual Classic Car & Hot Rod Display in Snohomish that year as well. Maybe this project gave you some ideas, or you already have an idea in mind for your own car, truck, motorcycle, refrigerator, etc. 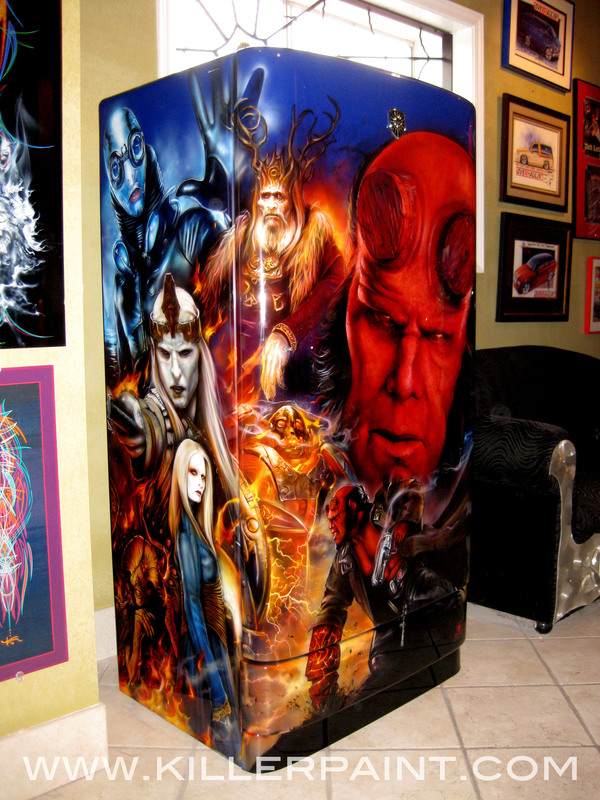 Back in 2009, a customer came to Killer Paint with a request to do a refrigerator for their home theater. 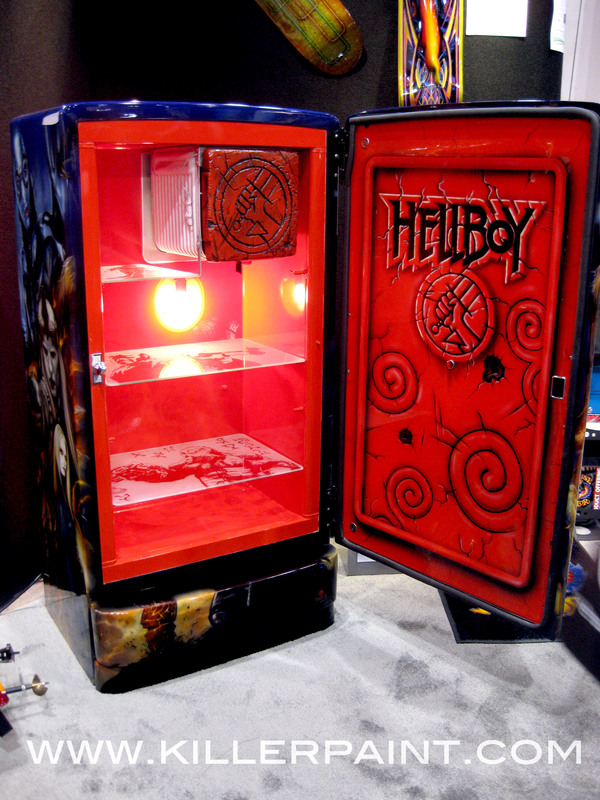 Being fans of the Hellboy films, they wanted an over-the-top theme based on the then recently released Hellboy 2: The Golden Army. 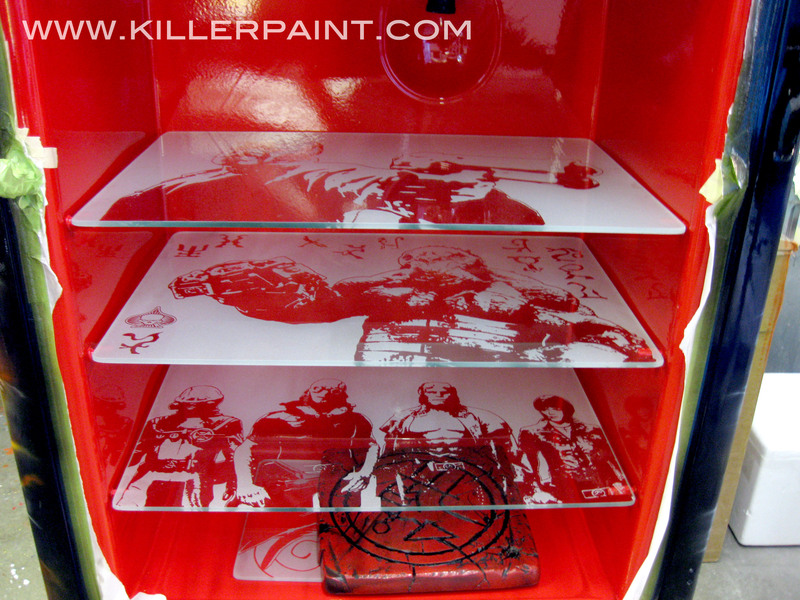 Many of the Killer Paint Custom refrigerators start off with a vintage unit. Models from past eras like the 1940’s 50’s and 60’s were built with an aesthetic that makes them very well suited to these kinds of projects. Their style was more akin to the lines and curves that a car might have, unlike most modern appliances, which tend toward the flat and blocky. They also tend to be much smaller than most modern full-sized refrigerators, so they fit much more easily into many non-kitchen areas of the home, such as game rooms, man caves, or home theaters. 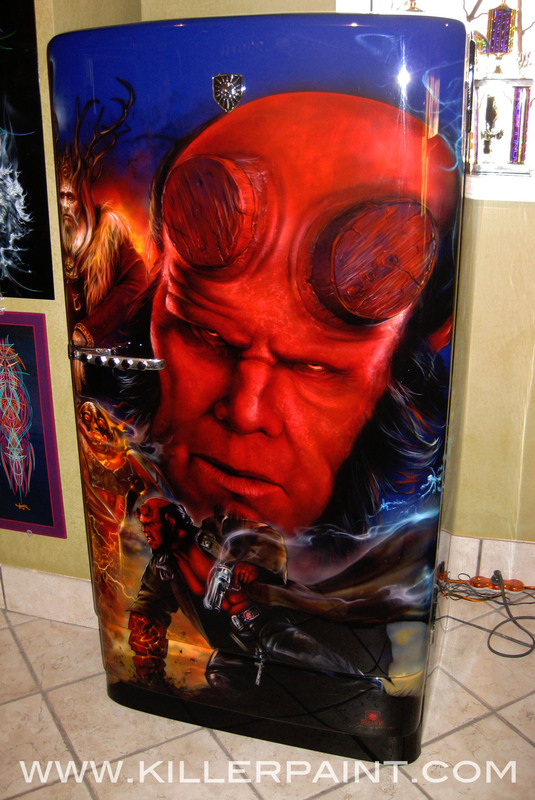 In this case, the Hellboy fridge started out its life as an older model GE fridge. It was still in reasonably good shape and quite functional, but it had quite a few changes in store. 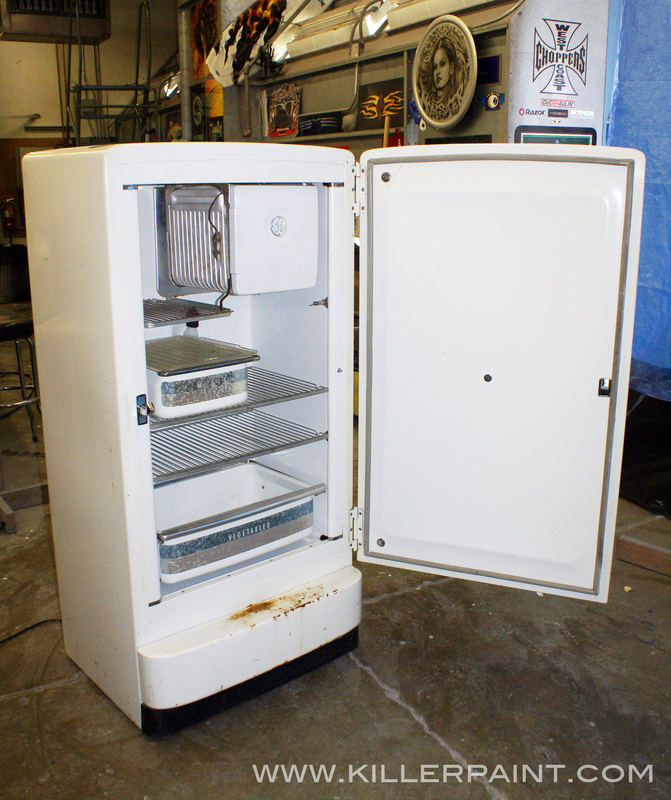 This refrigerator project was going to be much more than just a exterior face lift and a repaint. Normally, when a refrigerator gets painted here at the shop, just the outside surface gets the makeover. 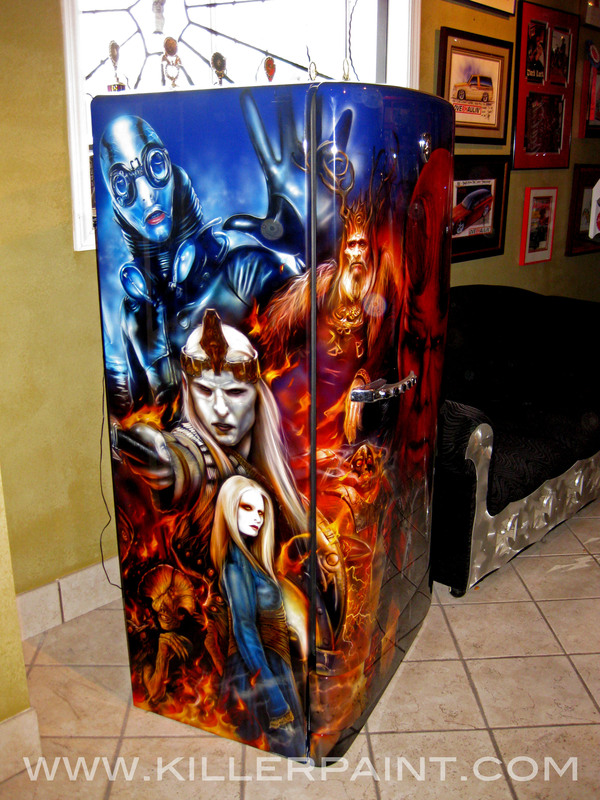 On previous custom fridge projects, painting or making any color changes to the inside of previous projects had been avoided, due to concerns about the potential durability and adhesion of the paint once the fridge is in daily by the customer, and can be troublesome to do correctly. Mike knew that for this theme, opening the door to a sterile white interior just wouldn’t do. 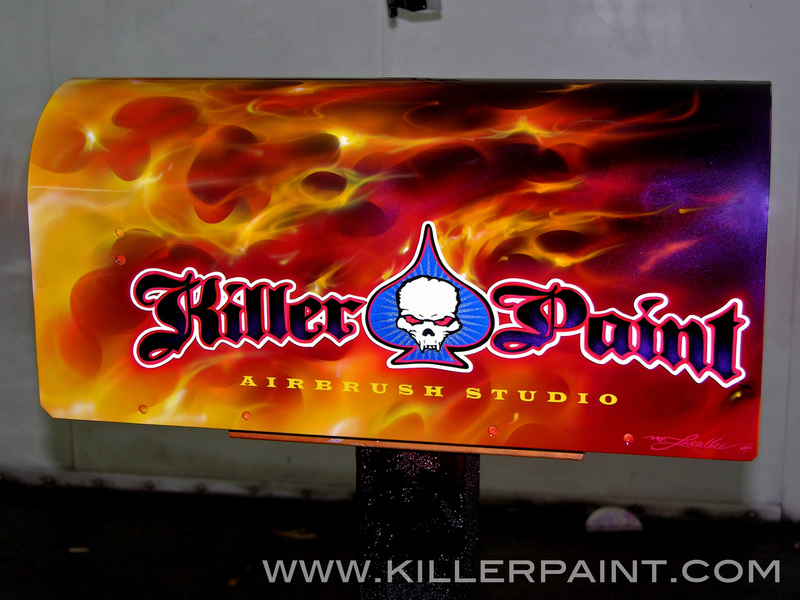 So for the first time at Killer Paint, the refrigerator was going to get painted inside and out. The interior surfaces were prepared and treated in such a way this time that would allow the paint to stand up better to wear and tear. Of course, red was the logical color choice for the inside on this piece. We’ll take a closer look at how the interior turned out a bit later. 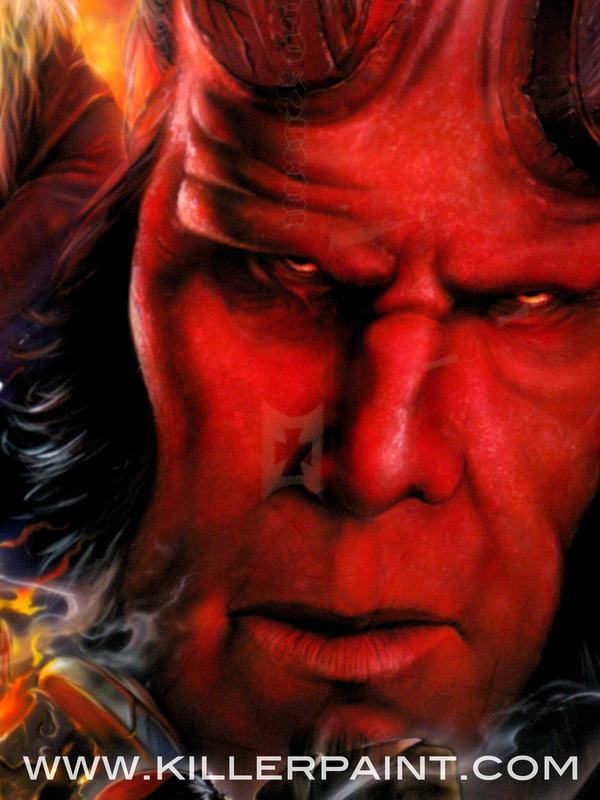 On the front door, a very large portrait of Hellboy himself (as portrayed by Ron Perlman) dominates the majority of the area. Mike wanted to do it large enough that he could put far more detail into the image, including fine wrinkles and skin texture. 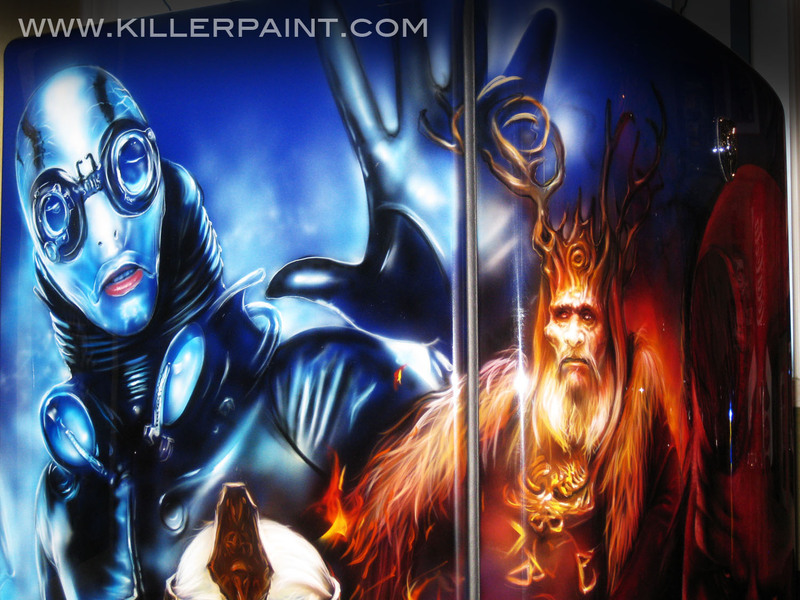 The left-hand side features the film’s aquatic protagonist Abe Sapien, as well as the primary elvish characters appearing in the film- Nuada, Nuala, and King Balor. 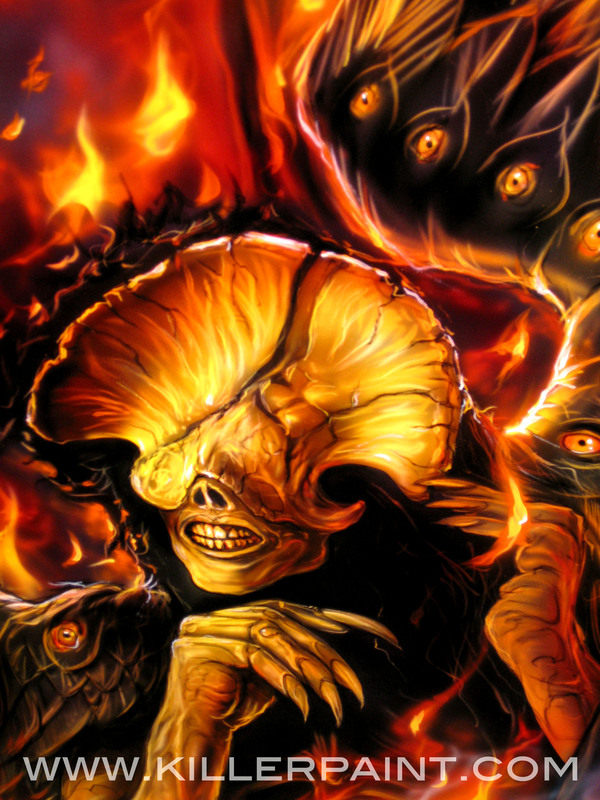 Guillermo del Toro, the director of Hellboy 2: The Golden Army, is well known for using fantastical imagery in his films, like the highly innovative Pan’s Labyrinth, whose influence is felt strongly in many of the elements of the Hellboy sequel. As such, there was a wide variety of subject matter available. The film is chock-full of visually spectacular scenes, as well as amazing characters and wonderful (or terrible) creatures. 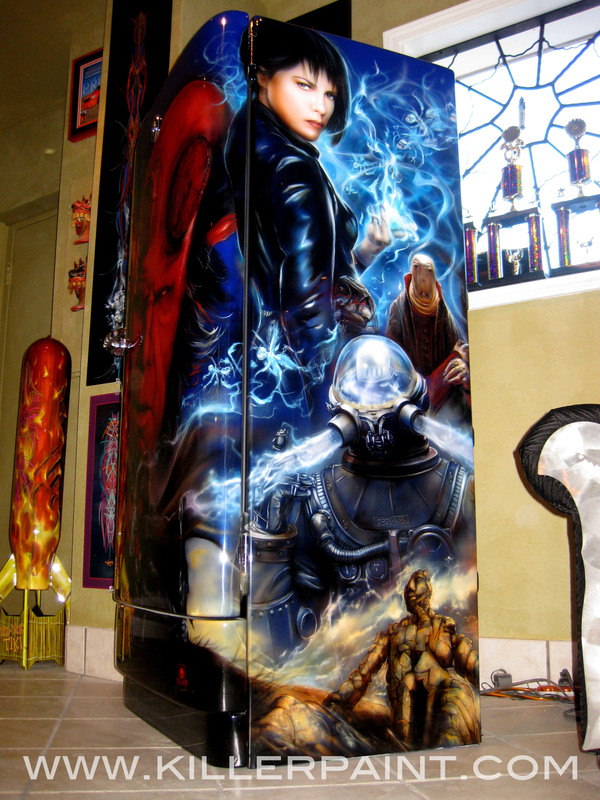 It’s almost too much to choose from, as far as deciding what to paint on this refrigerator. The inside panel of the door was also painted red to go with the interior. 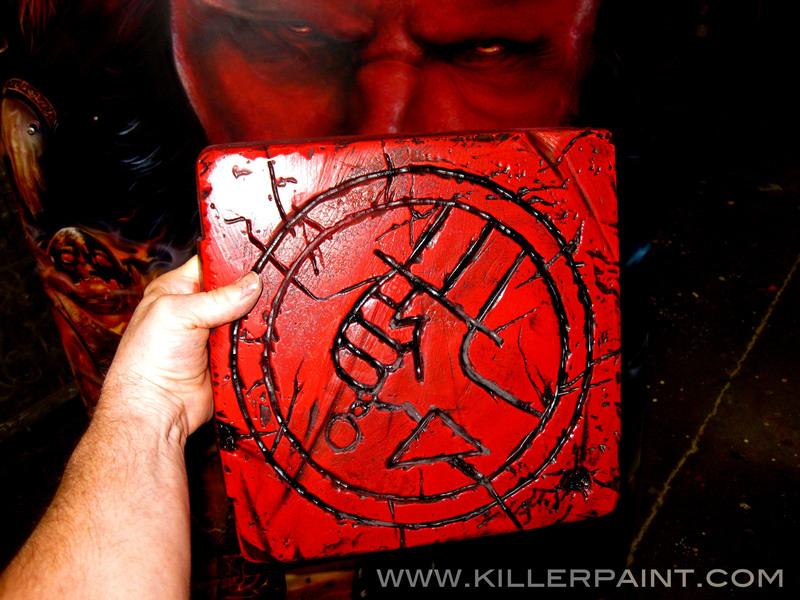 a faux-beveled border was painted on, and a large Hellboy logo, including the B.P.R.D emblem was painted prominently on the door. 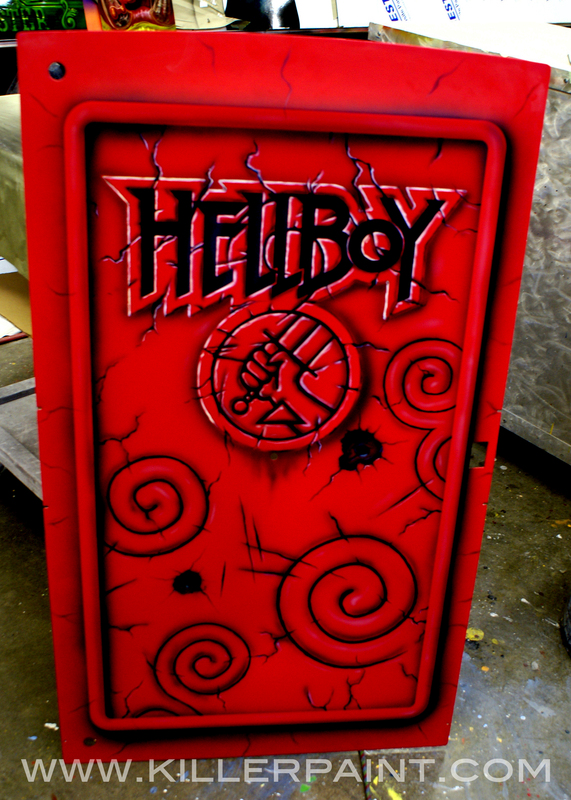 The rest of the panel is filled with an arrangement of spiral glyphs, similar to those etched in Hellboy’s skin in the film. Cracks were then painted in to give the impression that the panel is made of a rock-like material. For the small square door to the icebox, Mike sculpted another B.P.R.D. emblem along with scratches, cracks and other texture, then painted-weathered the panel to appear as though it were carved out of some kind of stone. With a brand new bright red interior, and faux stone doors, there was no way that the original wire shelves and drawers that the refrigerator came with would look good if they were placed back inside. Since the fridge was going to be for a home theater, and not storing meat of vegetables for meals, it was decided that the drawers would be left out entirely, to increase the amount of storage space available for beverages and snacks. As for the shelves, Mike had something in mind to replace them. 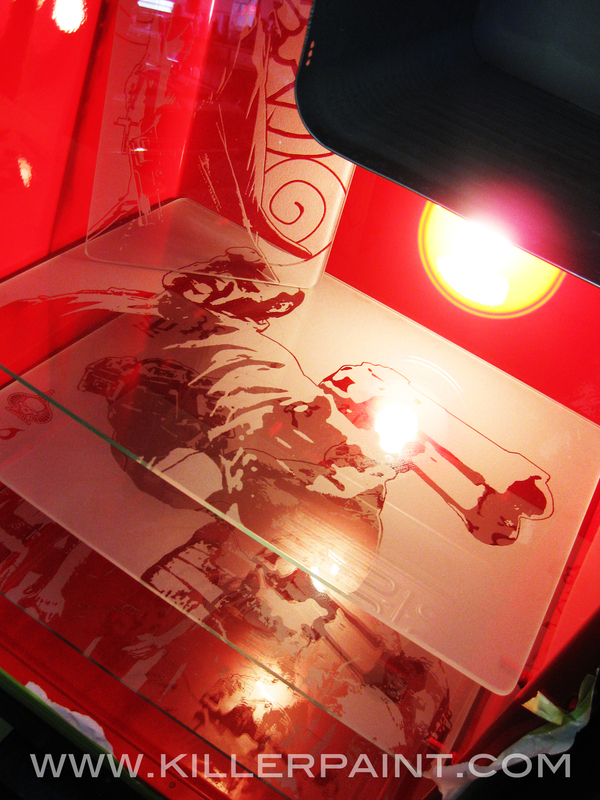 Using screen captures from the film, artwork was generated to use in order to etch the images on the underside of brand new, 1/4″ thick glass shelves. Three large shelves, plus one smaller shelf for the space adjacent to the icebox were made, and set on the pegs used for the original metal shelves. 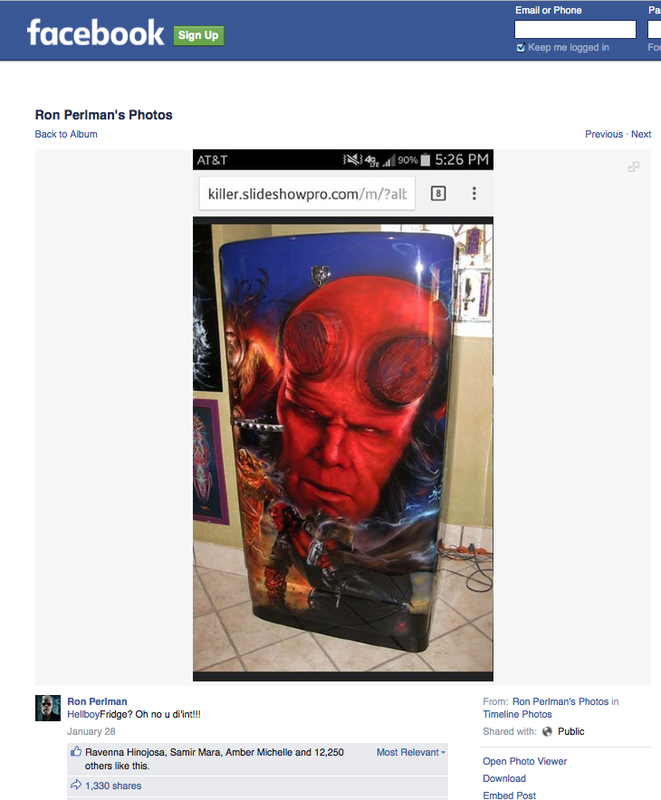 Ron Perlman himself saw and reposted a picture of the Hellboy fridge! Maybe this project gave you some ideas, or you already have an idea in mind for your own refrigerator, car, truck, motorcycle, etc. The technique for painting True Fire™ has been around for many years now, and yet it is still very much in demand. Since the first “Secrets of Painting True Fire™” DVD was released, custom painters the world over now use this method to paint realistic fire and flames on their own works. Unfortunately, not all artists have the same level of success doing so. While there are many keys to creating believable and eye-catching fire jobs, there are probably even more pitfalls that might keep an artist/painter from achieving the results they could have. The first step toward success on the path to painting flames is to know as much as you can about what you are trying to paint. Without a firm grasp on your subject matter, you could be starting off on the wrong foot. Every person has seen fire, and recognizes it when they see it. As such, an artist who intends to paint realistic fire does know what flames look like, and might believe they have a full understanding of it when they attempt to paint it. Unfortunately, having simply seen fire doesn’t mean that someone can always recreate it in paint accurately or realistically. Conceptually, fire is very simple. However its appearance can be very complex from an artistic standpoint. It can appear in many forms. From deep, smoldering flames, to wildly raging infernos, the shape, color and movement will all vary, depending on the kind of fire. The size or intensity of the flames, the temperature of the fire, as well as air flow or other movement can all affect how a given fire’s flames appear. That is why it is important to collect many images of actual fire to use as reference before attempting to paint flames. Study the pictures, not simply to replicate the image, but to understand how the colors and shapes come together. How they flow. Where the colors are dense, or where they are hazy, and so on. Trying to paint fire based off of one’s memory, or idea of fire, and not how it actually appears, can make things way more difficult than they need to be. 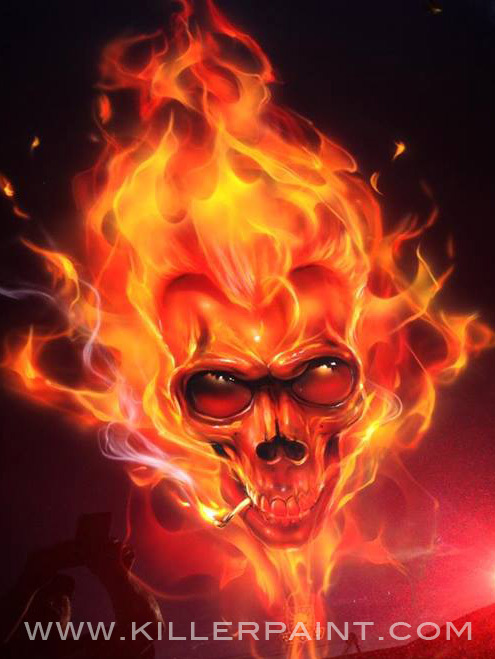 There are many ways to get images of fire to use when painting realistic flames. The easiest, and most powerful method is via the internet. Image searches on search engines like Google can yield wonderful results, but sometimes a lot of digging is required to find truly useful pictures. Try different combinations of keywords to find pictures that might not come up with simple search for “fire.” For example, a search using a term like “grease fire” or “forest fire” will typically get much more interesting results. Be sure to save any good images you find, so you won’t have to go searching for it again later. Try multiple search engines, too. Results from two different sources can be surprisingly different. Social media image sites like Pinterest and Instagram are also good resources to find resource images. Pinterest is especially effective because users organize their images into categories, so if you find one good image there, you are likely to find others related to it in the same place. You can even “pin” them into your own collection, and you will be able to access them from any computer or mobile device with an internet connection whenever and wherever you might need them. The first is safety. Fire is extremely dangerous, and you should only photograph fire in safe situations. Use extreme caution at all times around open flames. The other problems are technical. Flames are notoriously difficult to photograph well. Fire is constantly moving rather quickly, so many images will come out blurry, especially in low-light situations where cameras take longer exposures. So setting up a camera on a tripod, and adjusting your camera’s settings can help to improve the results somewhat. Even if the photos don’t turn out perfectly, they can often still be useful. You can still get a good idea of the brightness, color range, and movement of fire from a picture, even if it is a little bit blurry. That is really all you need, after all. You are going to want to create your own flames when it comes to painting anyway. The more pictures of fire and flames that you have, the more options and ideas you will have available to suit the specific type of look you want to achieve. After getting the look of painting fire correctly under your belt, you will eventually need to look at your reference photos less and less as it becomes more intuitive for you. This can take a lot of practice over a long time, though. Even then, it never hurts to go back and look at your fire reference images. You never know when you will spot something new that you might not have realized before. We hope you found this information useful. 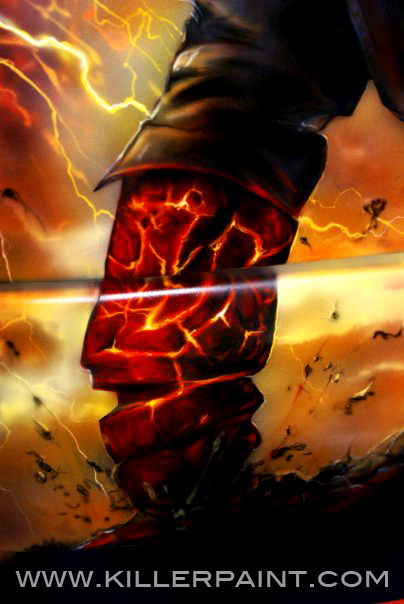 You may also wish to read True Fire Basics, Part 2 “What You Throw Down,” or True Fire™ Basics, Part 3: “Your Sword vs. Your Shield” or True Fire™ Basics, Part 4 “Square Pegs in Round Holes” on our website. We hope to have even more posts about painting and True Fire™ in the future. If you are interested in purchasing DVDs from the “Secrets of Painting True Fire™” series, click here. 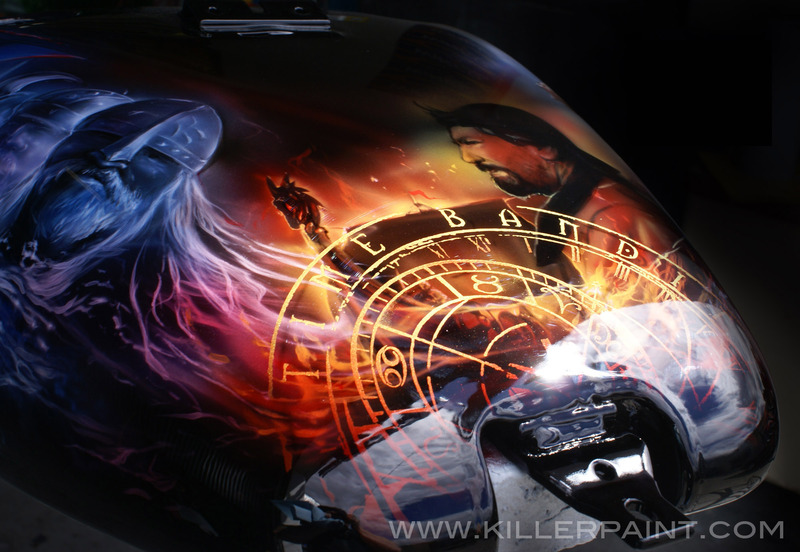 Visit Killer Paint’s online gallery here to see more examples of Mike Lavallee’s work.